Without Wagner would there have been a Third Reich - and what would Richard have thought about his greatest 'fan' - Adolf Hitler. ? 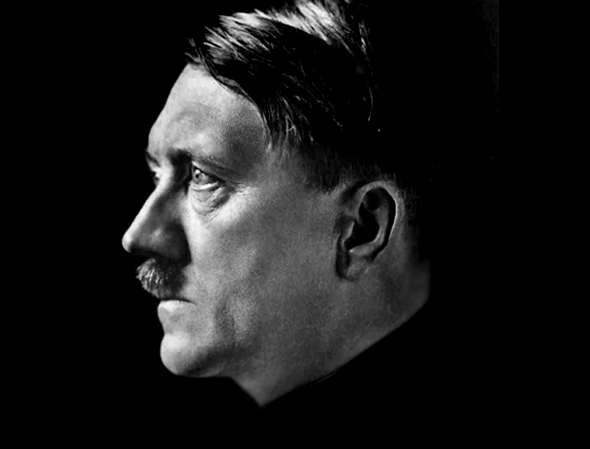 Undoubtedly much of Hitler's weltanschauung (world view or world philosophy) was dictated by the music, librettos and writings of his favourite composer. 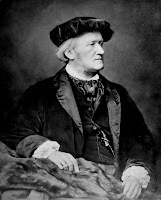 Wilhelm Richard Wagner (22 May 1813 – 13 February 1883) was a German composer, theatre director, polemicist, and conductor who is primarily known for his operas (or, as some of his later works were later known, "music dramas"). Unlike most opera composers, Wagner wrote both the libretto and the music for each of his stage works. 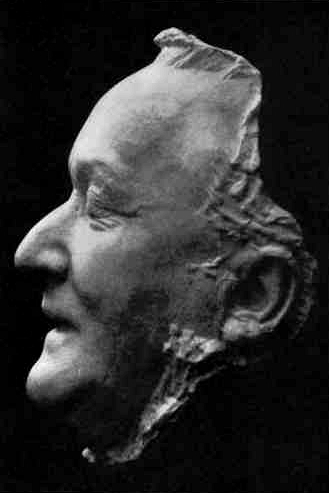 Initially establishing his reputation as a composer of works in the romantic vein of Weber and Meyerbeer, Wagner revolutionised opera through his concept of the Gesamtkunstwerk ("total work of art"), by which he sought to synthesise the poetic, visual, musical and dramatic arts, with music subsidiary to drama, and which was announced in a series of essays between 1849 and 1852. Wagner realised these ideas most fully in the first half of the four-opera cycle 'Der Ring des Nibelungen' (The Ring of the Nibelung). His compositions, particularly those of his later period, are notable for their complex textures, rich harmonies and orchestration, and the elaborate use of leitmotifs—musical phrases associated with individual characters, places, ideas or plot elements. His advances in musical language, such as extreme chromaticism and quickly shifting tonal centres, greatly influenced the development of classical music. 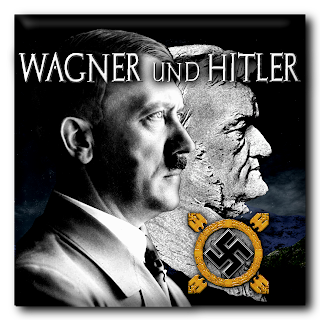 In addition there was a personal element to Hitler's connection with Wagner. 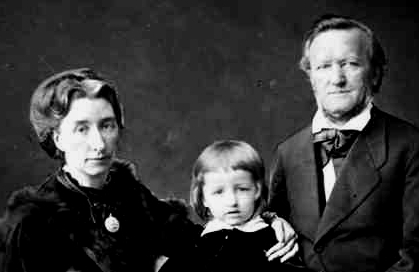 Of course Wagner died in 1883, and Hitler was born in 1889 - so there could be no direct, personal connection - however Wagner had a son, Siegfried, and Siegfried, despite his homosexuality, had sons - Wolfgang and Wieland. After the death of Siegfried Wagner in 1930, Winifred Wagner, Siegfried's wife, took over the Bayreuth Festival, running it until the end of World War II. 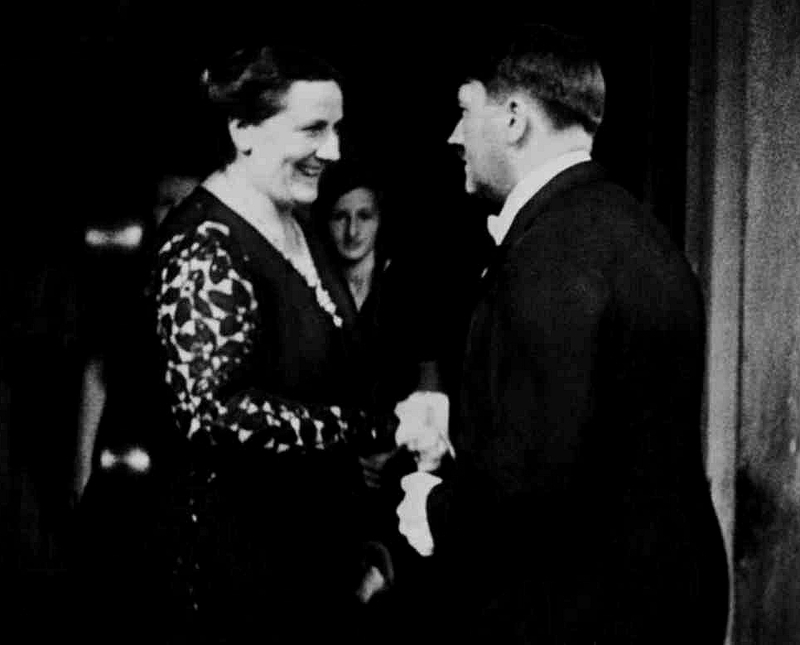 In 1923, Winifred met Adolf Hitler who, as we know, greatly admired Wagner's music. When Hitler was jailed for his part in the Munich Beer Hall Putsch, Winifred sent him food parcels and stationery on which Hitler's autobiography 'Mein Kampf' was written. In the late 1930s, she served as Hitler's personal translator during treaty negotiations with England. Winifred's relationship with Hitler grew so close that by 1933 there were rumors of impending marriage. 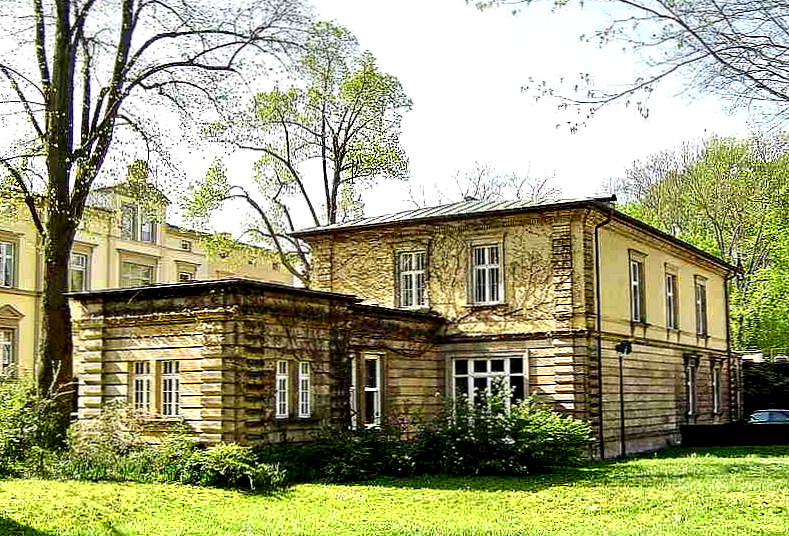 'Haus Wahnfried', the Wagner home in Bayreuth, became Hitler's favorite retreat, and he had his own separate accommodation in the grounds of Wahnfried, known as the Führerbau. The name of the villa Wahnfried, is interesting. 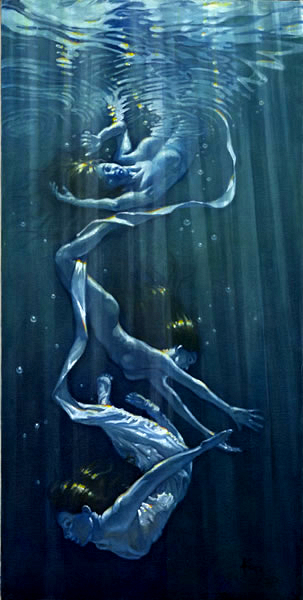 Wahnen means endless striving of an artist for the fulfilment of his aspirations and the triumph of his art. So Wahnfried (Wahnen free) was the name chosen and even today we can see Wagner's motto on the front: "Here where my delusions have found peace, let this place be named Wahnfried." Above the door to the villa is a giant mural, depicting Wotan, King of the Gods and the philandering wanderer, being welcomed by classical women. We should also note that Wotan was the name of Wagner’s beloved St Bernard dog. The whole house was a place where Wagner could compose, raise his family and entertain guests. The Grand Hall is the largest room in the villa, and is a two-storey space with a gallery around the second floor and a skylight in the ceiling. 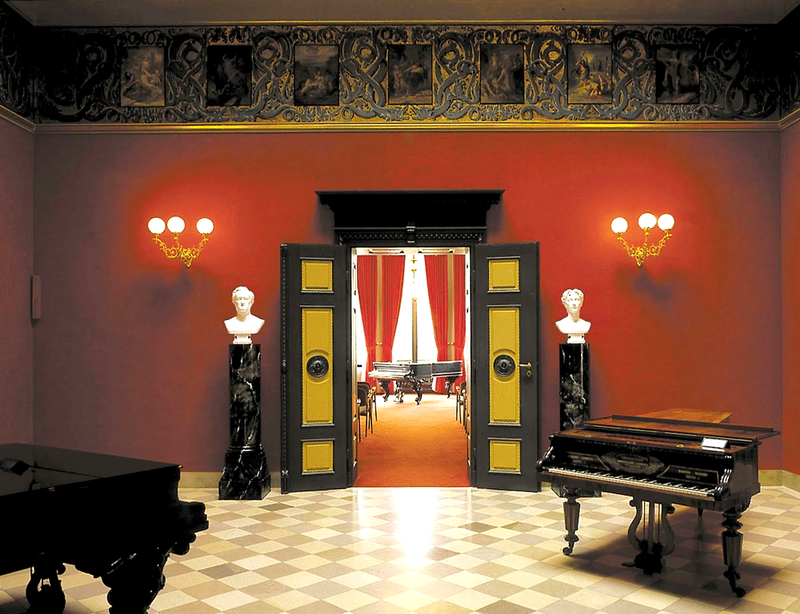 Furnishings include two of Wagner's pianos and numerous busts. 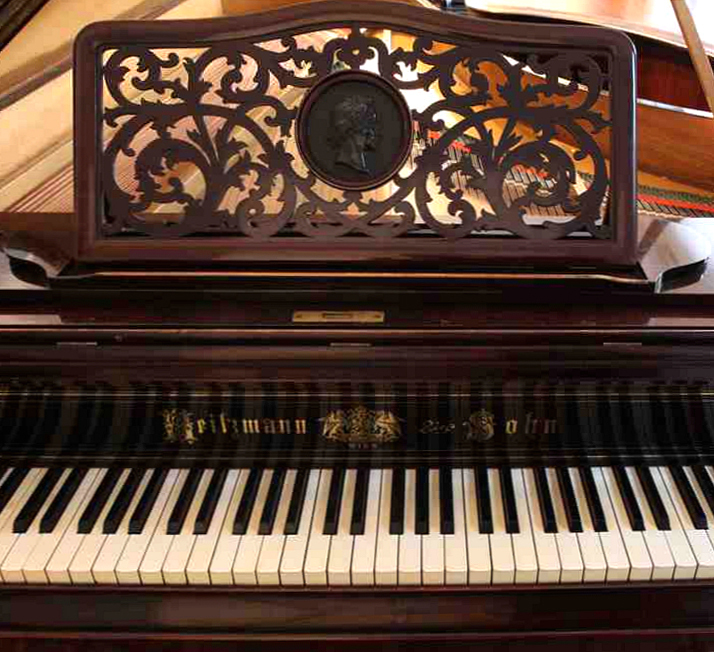 The specially designed Bechstein piano was the piano Wagner used when he was composing Meistersinger, part of Siegfried and Parsifal. It was a present from the endlessly patient, endlessly generous King Ludwig II for Wagner's birthday in 1864. In a shady grove beyond the garden, surrounded with ivy, is the tomb of Richard and Cosima Wagner. The stone is unmarked, because as Wagner insisted, as long as it remained, everyone would know who was buried there. The most momentous non-event of the century occurred in February of 1908. And it occurred in Vienna to Alfred Roller. Today Roller is not so much underestimated as unknown, at least outside a small circle of opera devotees. 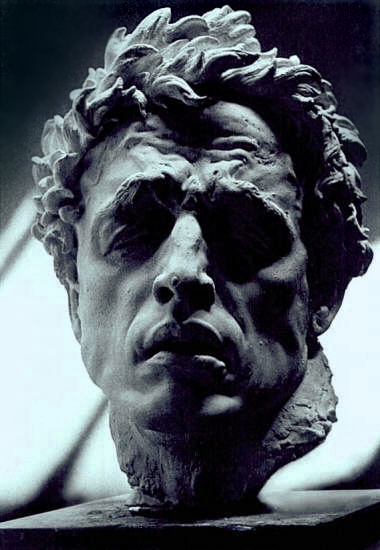 Yet in 1908 he was one of the most important figures on the Viennese artistic scene. He was a painter who, along with Gustav Klimt, organized the Vienna Secession. He was also professor of fine arts and soon to be appointed director of the School of Applied Arts. But above all he was a stage designer of great distinction. Alfred Roller (2 October 1864, Brünn, Mähren — 21 June 1935, Vienna) was an Austrian painter, graphic designer, and set designer. Roller at first studied painting at the Academy of Fine Arts in Vienna under Christian Griepenkerl and Eduard Peithner von Lichtenfels, but eventually became disenchanted with the Academy's traditionalism. In 1897 he co-founded the Viennese Secession with Koloman Moser, Joseph Maria Olbrich, Josef Hoffmann, Gustav Klimt, and other artists who rejected the prevalent academic style of art. 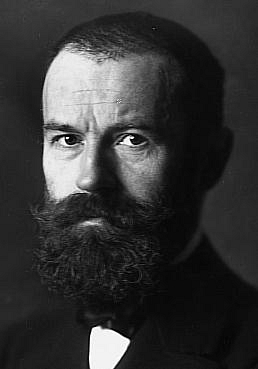 He became a professor of drawing at the University of Applied Arts Vienna (Kunstgewerbeschule) in 1899, and president of the Secession in 1902. In his early career Roller was very active as a graphic designer and draughtsman. He designed numerous covers and vignettes for the pages the Secessionist periodical Ver Sacrum, as well as the posters for the fourth, fourteenth, and sixteenth Secession exhibitions. He also designed the layout of the exhibitions themselves. In 1902 Roller was introduced to the composer Gustav Mahler by Carl Moll. Roller expressed an interest in stage design and showed Mahler several sketches he had made for Wagner's 'Tristan und Isolde'. Mahler was impressed and decided to employ Roller to design the sets for a new production of the piece. 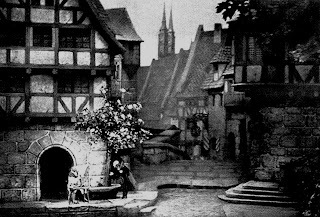 The production, which premiered in February 1903, was a great critical success. 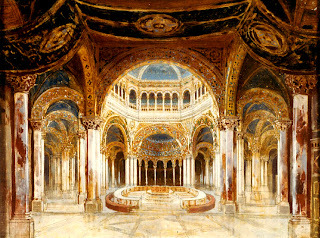 Roller continued to design sets for Mahler's productions. Eventually Roller left the Secession and his teaching post at the Kunstgewerbeschule to be appointed chief stage designer to the Vienna State Opera, a position he held until 1909. Gustav Klimt (July 14, 1862 – February 6, 1918) was an Austrian symbolist painter and one of the most prominent members of the Vienna Secession movement. Klimt is noted for his paintings, murals, sketches, and other objets d'art. Klimt's primary subject was the female body; his works are marked by a frank eroticism. Gustav Klimt was born in Baumgarten, near Vienna in Austria-Hungary. 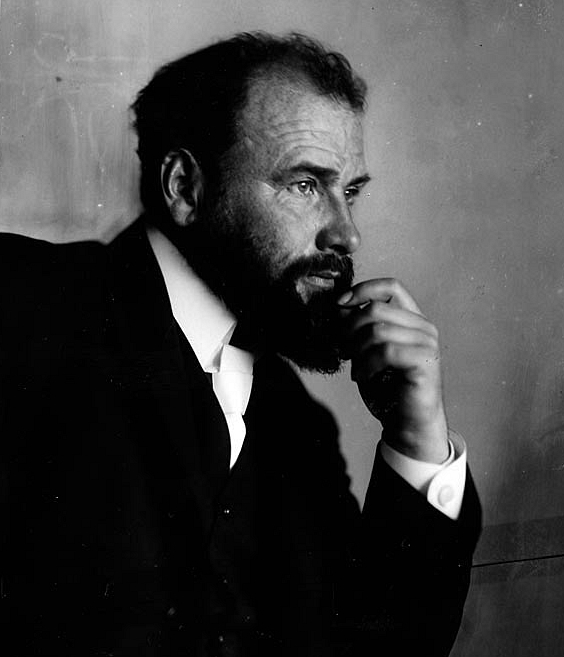 His mother, Anna Klimt (née Finster), had an unrealized ambition to be a musical performer. His father, Ernst Klimt the Elder, formerly from Bohemia, was a gold engraver. All three of their sons displayed artistic talent early on. Klimt's younger brothers were Ernst Klimt and Georg Klimt. Klimt became one of the founding members and president of the Wiener Sezession (Vienna Secession) in 1897 and of the group's periodical, Ver Sacrum ("Sacred Spring"). He remained with the Secession until 1908. 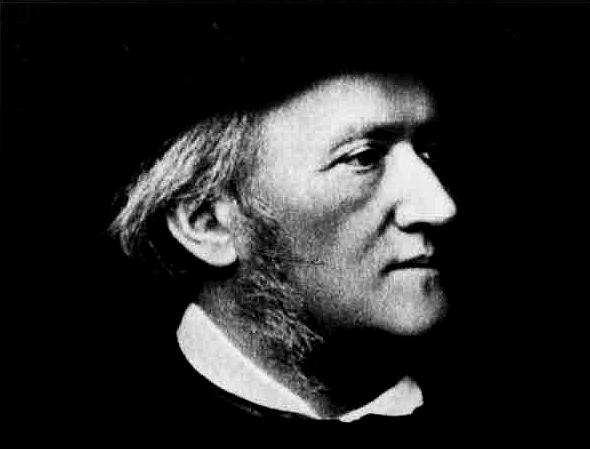 In 1903, on the twentieth anniversary of Wagner’s death, he and Gustav Mahler initiated a cycle of the composer’s works in fresh musical and visual interpretations. 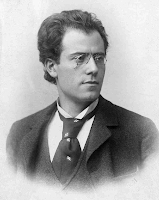 Gustav Mahler (7 July 1860 – 18 May 1911) was a late-Romantic Austrian composer and one of the leading conductors of his generation. His family later moved to nearby Iglau (now Jihlava), where Mahler grew up. 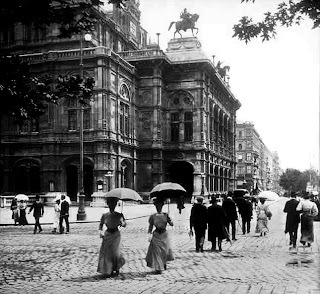 On 8 October 1897 Mahler was formally appointed to succeed Jahn as the Hofoper's director. Early in 1902 Mahler met Alfred Roller, an artist and designer associated with the Vienna Secession movement. A year later, Mahler appointed him chief stage designer to the Hofoper, where Roller's debut was a new production of 'Tristan und Isolde'. The collaboration between Mahler and Roller created more than 20 celebrated productions of, among other operas. The 'Tristan and Isolde' of that year marked the first break with the Bayreuth tradition. 'Tristan und Isolde' is an opera, or music drama, in three acts by Richard Wagner to a German libretto by the composer, based largely on the romance by Gottfried von Straßburg. It was composed between 1857 and 1859 and premièred in Munich on 10 June 1865 with Hans von Bülow conducting. Wagner referred to the work not as an opera, but called it "eine Handlung" (literally a drama or a plot), which was the equivalent of the term used by the Spanish playwright Calderón for his dramas. Wagner's composition of 'Tristan und Isolde' was inspired by his affair with Mathilde Wesendonck and the philosophy of Arthur Schopenhauer. Widely acknowledged as one of the peaks of the operatic repertory, Tristan was notable for Wagner's advanced use of chromaticism, tonality, orchestral colour and harmonic suspension. That production and those that followed - in particular the premiere of 'Der Rosenkavalier' in 1911 made him the world’s most talked-about operatic producer. In that first week of February, Roller received a letter from a friend declaring that a young man of her acquaintance was a great admirer of his. The lad was an aspiring painter and loved opera; he would give anything, she wrote, to meet Roller to discuss his professional prospects, either in painting or in stage design. Despite his heavy commitments, Roller generously agreed to meet him, take a look at some of his work and advise him on a career. The young man was overjoyed, and a short time later, with Roller’s reply and a portfolio of his works in hand, went to the opera house. On reaching the entrance, so he later said, he got cold feet and left. A short time later he summoned up his courage, returned and this time made it as far as the grand staircase, when he again took fright. On a third occasion he was well on his way to Roller’s office when an opera house attendant asked his business. At that, he turned on his heels and fled for good. 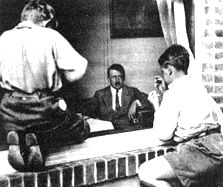 Now young Adolf was not a naturally timid young man - so what was it that prevented him from meeting Roller. Was there some force, that prevented him from taking the critical that would have decisively changed world history ? But he never forgot the gesture, and when he finally met Roller in 1934, he told him the story. The young man was now chancellor of Germany. If only, history sighs, Roller and Hitler had met in 1908 and Hitler had been taken on as an assistant at the opera, or enrolled at the School of Applied Arts. In any event Hitler never lost his admiration of Roller. When Winifred Wagner decided in 1933 to stage a new production of Richard Wagner's 'Parsifal' at Bayreuth - the first since the original of 1882 - Hitler, not unnaturally proposed Roller to do it, although he had other, more obscure reasons for making that request (see below) and she agreed. 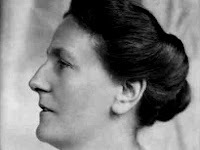 Winifred Wagner (23 June 1897 – 5 March 1980) was an English woman and wife of Siegfried Wagner, Richard Wagner's son. She was the effective head of the Wagner family from 1930 to 1945. In 1923, Winifred met Adolf Hitler, who greatly admired Wagner's music. When Hitler was jailed for his part in the Munich Beer Hall Putsch, Winifred sent him food parcels and stationery on which Hitler's autobiography Mein Kampf may have been written. In the late 1930s, she served as Hitler's personal translator during treaty negotiations with Britain. 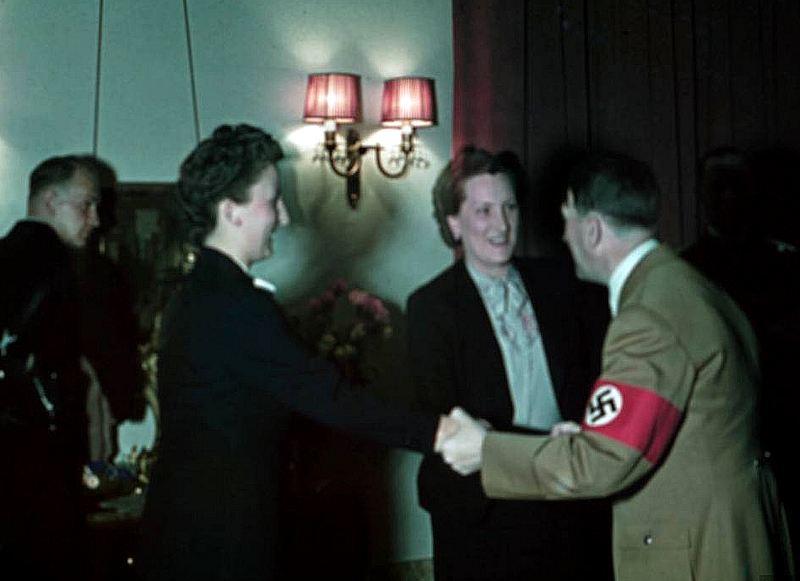 Her relationship with Hitler grew so close that by 1933 there were rumors of impending marriage. 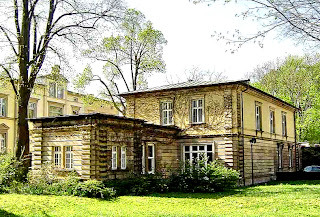 Haus Wahnfried, the Wagner home in Bayreuth, became Hitler's favorite retreat. Hitler gave the festival government assistance and tax exempt status, and treated Winifred's children solicitously. She corresponded with Hitler for nearly two decades. Scholars have not been allowed to see the letters which are kept locked away by one of Winifred's grandchildren, Amélie Lafferentz. 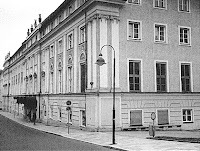 Wahnfried was the name given by Richard Wagner to his villa in Bayreuth. The name is a German compound of Wahn (delusion, madness) and Fried(e), (peace, freedom). So how did it all start ? Hitler’s love affair with Wagnerian opera had begun in Linz in1901 when at the age of twelve he attended his first opera. Linz is the third-largest city of Austria and capital of the state of Upper Austria (German: Oberösterreich). 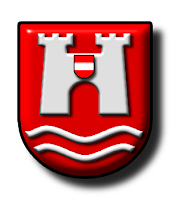 IAdolf Hitler was born in the border town of Braunau am Inn but moved to Linz in his childhood. Hitler spent most of his youth in the Linz area, from 1898 until 1907, when he left for Vienna. 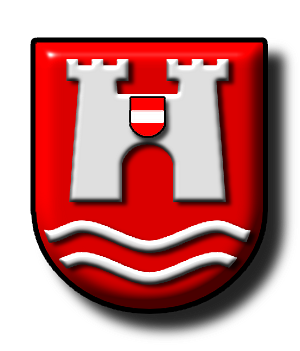 The family lived first in the village of Leonding on the outskirts of town, and then on the Humboldtstrasse in Linz. After elementary education in Leonding, Hitler was enrolled in the Realschule (school) in Linz with the philosopher Ludwig Wittgenstein. 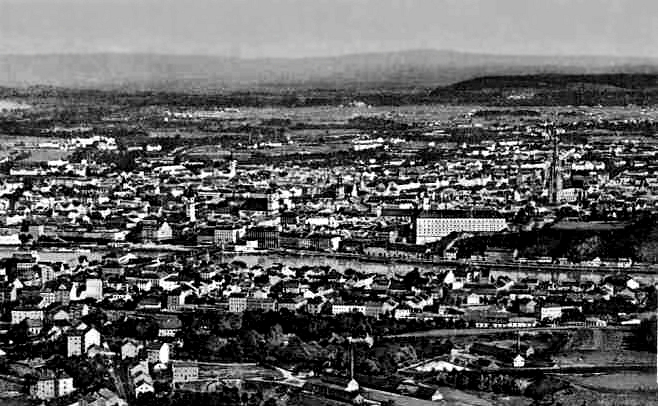 To the end of his life, Hitler considered Linz to be his "home town", and envisioned extensive architectural schemes for it, wanting it to become the main cultural centre of the Third Reich. ‘I was captivated at once. My youthful enthusiasm for the Master of Bayreuth knew no bounds. From that moment the lad found himself addicted, literally so, to Wagner’s operas. The composer’s musical and intellectual influence in Central Europe was then at its zenith, and Hitler em-braced the cult as devoutly as anyone. During the years following the ecstasy of that first 'Lohengrin' performance, Hitler returned to the Linz Opera house night after night. It was there that he eventually met another opera enthusiast, August Kubizek. August ("Gustl") Kubizek (3 August 1888, Linz – 23 October 1956, Eferding) was a close friend of Adolf Hitler when both were in their late teens. He later wrote about their friendship. The slightly older August (nine months), although training to follow in the footsteps of his father as an upholsterer, was a serious amateur musician, able to play several stringed and brass instruments. In a short time he became the sole friend of Hitler’s youth. It was not simply the mutual interest in opera that drew them together but the compliant Kubizek’s willingness - an absolute requisite for everyone else later as well - to listen in tacit agreement, or at least silence, as the domineering 'Adi' expatiated on whatever caught his fancy. 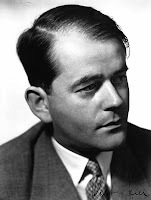 According to Hitler’s comments to Albert Speer, the two young men spent hours wandering through the streets of Linz as Hitler talked about music, architecture and the importance of the arts. 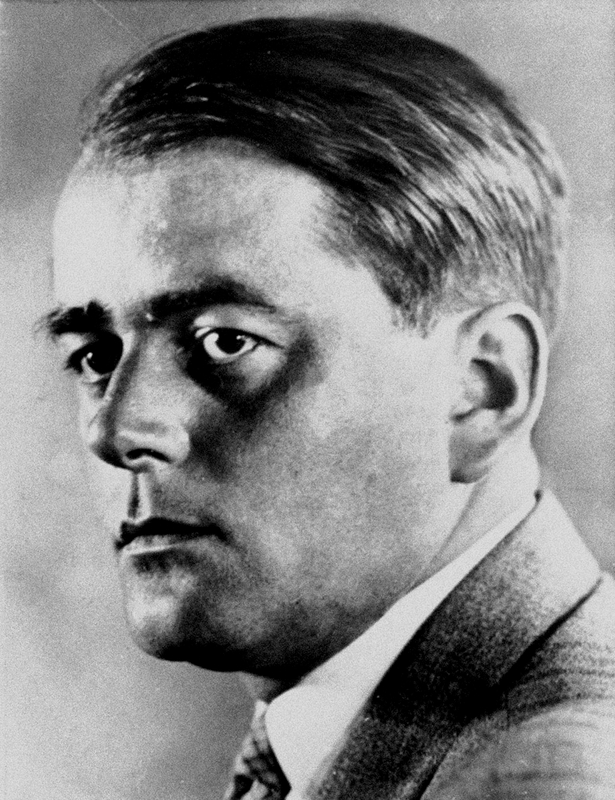 Berthold Konrad Hermann Albert Spee - March 19, 1905 – September 1, 1981 - was a German architect who was, for a part of World War II, Minister of Armaments and War Production for the Third Reich. 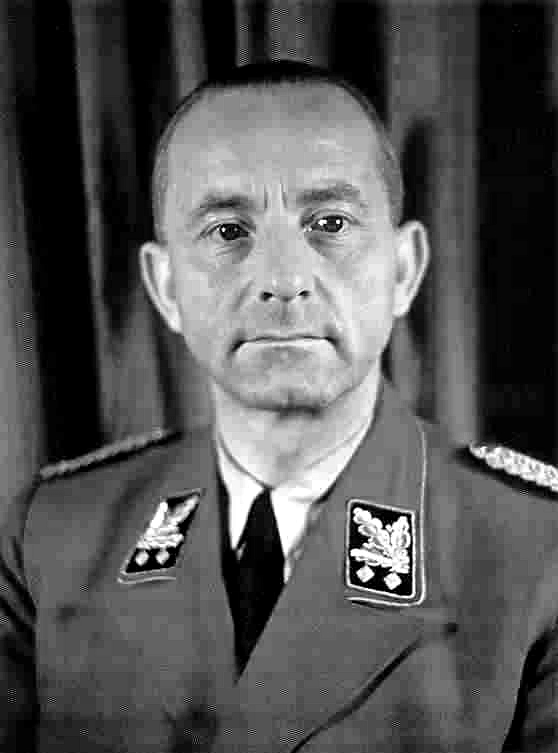 Speer was Adolf Hitler's chief architect before assuming ministerial office. 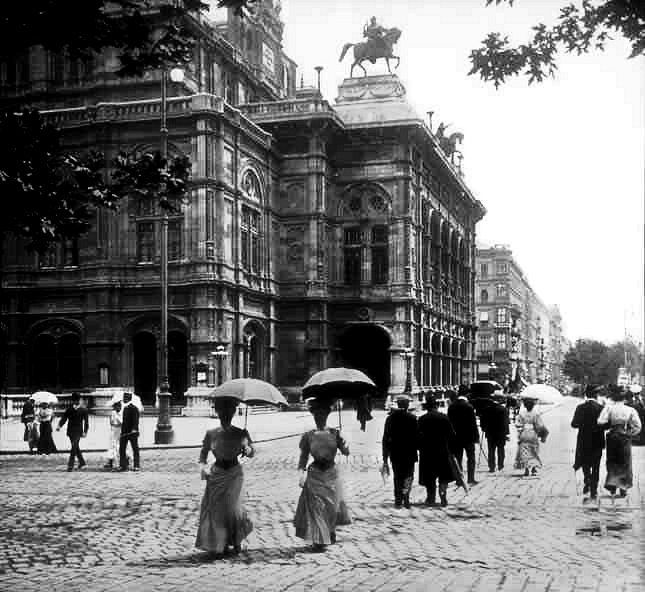 On visiting Vienna for the first time in 1906, it was to Kubizek that he wrote. ‘Tomorrow I am going to the opera, 'Tristan', and the day after 'Flying Dutchman', etc.,’ he reported soon after arriving. 'The interior of the edifice is not exciting. If the exterior is mighty majesty, lending the building the seriousness of an artistic monument, one feels in the interior admiration rather than dignity. On settling in Vienna the following year, he persuaded Kubizek, who had been admitted to the Music Conservatory, to join him there. The two lived together until 1908 when Hitler, following the humiliation of his second rejection by the Academy of Fine Arts, suddenly vanished from his companion’s life. Beyond his 'Wagnermania', little is known for certain about Hitler’s youthful activities. He sang in a church choir at Lambach Abbey (Stift Lambach) - a Benedictine monastery in Lambach in Austria. 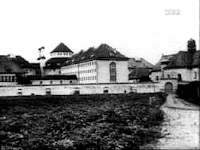 A monastery was founded in about 1040 by Count Arnold II of Lambach-Wels. His son, Bishop Adalbero of Würzburg (later canonised), changed the monastery into a Benedictine abbey ten year later. Since 1056 it has been a Benedictine abbey. During the 17th and 18th centuries a great deal of work in the Baroque style was carried out, much of it by the Carlone family. Lambach escaped the dissolution of the monasteries of Emperor Joseph II in the 1780s. In 1897/98 Adolf Hitler had lived in the town of Lambach (with his parents). He went to the secular Volksschule at which Benedictine teachers were employed. Hitler had seen several swastikas each day as a boy in Lambach, when he attended the Benedictine monastery school, which was decorated with carved stones and woodwork that included the symbol. On leaving school, the young Adolf joined a music club, and took piano lessons from October 1906 until the end of the following January from a man named Josef Prawratsky. 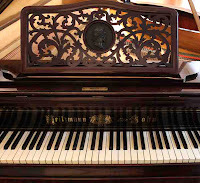 He soon quit because of lack of money as a result of the expense of his mother’s cancer treatments, however, his sister Paula recalled him ‘sitting for hours at the beautiful Heitzmann grand piano my mother had given him’. 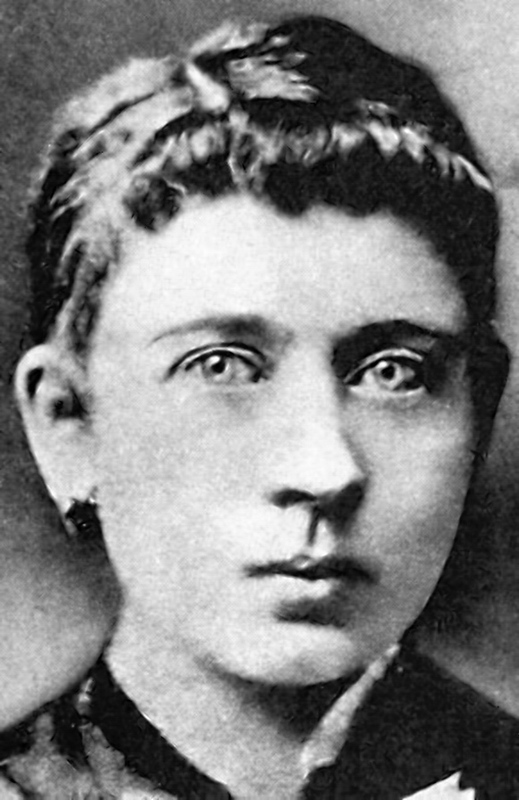 Klara Hitler née Pölzl (12 August 1860 – 21 December 1907) was an Austrian woman, and the mother of Nazi dictator Adolf Hitler. 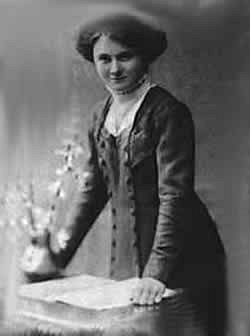 Paula Hitler (Paula Wolf) (21 January 1896 in Hafeld, Austria – 1 June 1960 in Berchtesgaden) was the younger sister of Adolf Hitler and the last child of Alois Hitler and his third wife, Klara Pölzl. Paula was the only full sibling of Adolf Hitler to survive into adulthood. In later years he occasionally played - according to Winifred Wagner fairly well - but what he played remains a mystery. Kubizek’s 1954 book, 'Young Hitler' indicates that Hitler had a fairly solid musical background. Hitler was devoted to the works of Haydn, Mozart and Beethoven, as well as Bruckner, Weber, Schubert, Mendelssohn, Schumann and Grieg, and he was especially fond of Mozart, and of Beethoven’s violin and piano concertos, and above all Schumann’s piano concerto. The assertion that Hitler read Wagner’s prose writings and everything else he could get his hands on by or about Wagner is contradicted by Franz Jetzinger, librarian at the Linz archive, that Hitler did no serious reading at all at the time - however this has been strongly disputed (see below). Jetzinger gained fame in 1958 through the English version of his book 'Hitler’s Youth', in which he could refute many of Hitler’s statements about his early years. 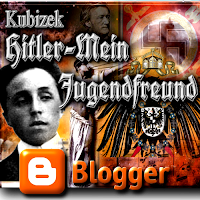 Moreover, Jetzinger attracted attention by attacking an earlier published book 'The Young Hitler I Knew' by August Kubizek, whom Jetzinger accused of spreading falsehoods. While earlier Hitler biographers like Joachim Fest or Werner Maser adopted Jetzinger’s criticism as their own, Jetzinger’s crushing judgment of Kubizek’s credibility is now challenged by Brigitte Hamann, author of 'Hitlers Wien'. 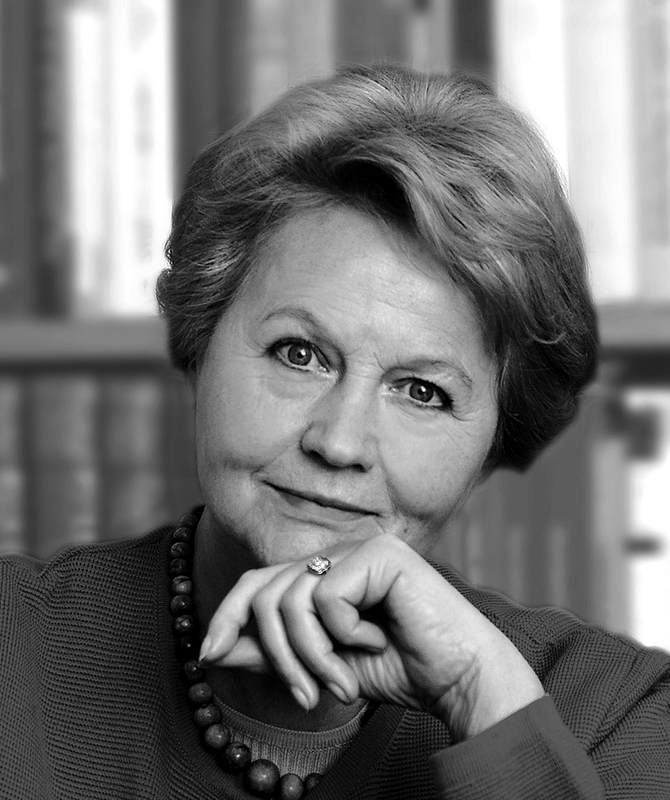 Hamann asserts personal motives for Jetzinger’s tendency to illustrate nearly every statement in Kubizek’s book as an ex post modification of facts, claiming Jetzinger was economically motivated, because the previous release of Kubizek’s book supposedly undermined the sale of his own work. Many of Jetzinger's statements have now been disscredited. The young Hitler was undoubtedly enthralled by Wagner’s music and he was 'transported into that extraordinary state which Wagner’s music produced in him, that trance, that escape into a mystical dream-world . . . . . . a changed man; his violence left him, he became quiet, yielding and tractable . . . . intoxicated and bewitched . . . . . . willing to let himself be carried away into a mystical universe . . . . . . from the stale, musty prison of his back room, trans-ported into the blissful regions of Germanic antiquity . . .' according to Kubizek. According to some sources Hitler wrote an opera, based on a prose sketch which Wagner had developed, but abandoned, entitled 'Wieland der Schmied' (Wieland the Blacksmith). An entire chapter of Kubizek's book is devoted to the story and tells how the young Hitler worked out leitmotifs, a cast of characters, a plot, a dramatic structure and a rough score. Even after the passage of forty-five years, Kubizek was able to recall the specific names, all old-Teutonic, of the characters. Within three days of conceiving the idea of the opera, Hitler had already composed an overture - in Wagnerian style - which he played for his friend on the piano in their completely darkened room. 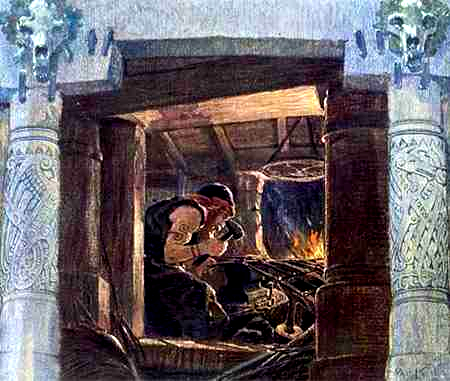 In Germanic and Norse mythology, Wayland the Smith (Old English: Wēland; Old Norse: Völundr, Velentr; Old High German: Wiolant; Proto-Germanic: *Wēlandaz, from *Wēla-nandaz, lit. "battle-brave") is a legendary master blacksmith. In Old Norse sources, Völundr appears in Völundarkviða, a poem in the Poetic Edda, and in Þiðrekssaga, and his legend is also depicted on the Ardre image stone VIII. 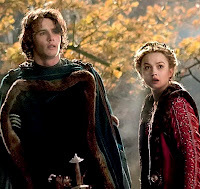 In Old English sources, he appears in Deor, Waldere and in Beowulf and the legend is depicted on the Franks Casket. He is mentioned in the German poems about Dietrich von Bern as the Father of Witige. Kubizek also explains how Hitler dreamed up the idea of a ‘Mobile Reichs Orchestra’ - or 'Reich Symphony Orchestra' - which was to tour German provinces and perform without charge. 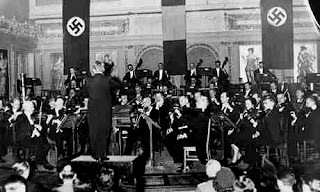 In 1928 an orchestra dedicated to promoting National Socialist ideals was organized and in 1931 it became, with Hitler’s approval, a travelling National Socialist Symphony Orchestra. By far the best known of Kubizek’s stories relates to 'Rienzi'. Following a performance at the Linz Opera of Wagner’s 'Rienzi', Hitler ascended to a high place - the Freinberg Hill overlooking the city - where he experienced an ideological epiphany. 'Rienzi, der Letzte der Tribunen' (Rienzi, the Last of the Tribunes) is an early opera by Richard Wagner in five acts, with the libretto written by the composer after Bulwer-Lytton's novel of the same name (1835). Written between July 1838 and November 1840, it was first performed at the Hofoper, Dresden, on 20 October 1842, and was the composer's first success. Inspired by the hero of the opera, a simple man driven by a sense of mission to restore greatness to Rome, Hitler fell into a state of ‘complete ecstasy and rapture’ and declared that he too was destined to lead his people to greatness. Kubizek went on to say that he mentioned the episode to Hitler when they met in Bayreuth in 1939 and found that he recalled it. ‘In that hour it began,’ the Führer commented. And it is a story that is anchored in fact. One fact is that the opera was actually performed at the local opera house beginning in January 1905. Another is that this is a case where the book and the ‘Reminiscences’ are consistent. 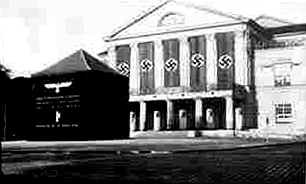 But most telling is Hitler’s own testimony to Speer in 1938, a full year before Kubizek raised the topic at Bayreuth. Explaining why the party rallies opened with the overture to the opera, he said it was not simply because of the impressiveness of the music but also because it had great personal significance. ‘I believe it was God’s will to send a youth from here into the Reich, to let him grow up, to raise him to be the leader of the nation so as to enable him to lead his homeland back into the Reich’. 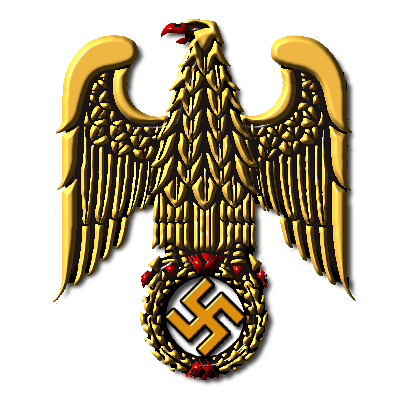 The Anschluß (German for "connection" or union), also known as the Anschluss Österreichs, was the reunion of Austria with the Third Reich in 1938. With the Anschluß, the German-speaking Republic of Austria ceased to exist as a fully independent state. 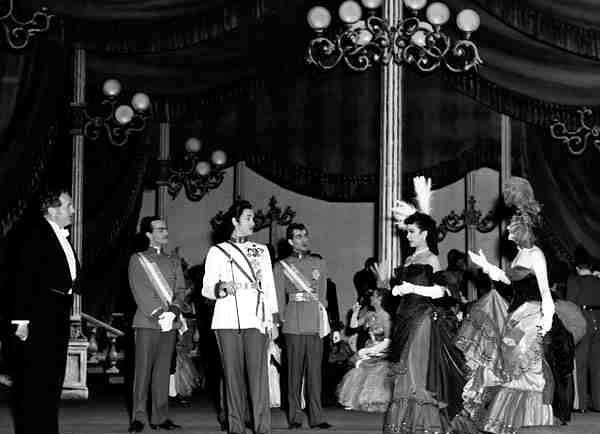 In some sense, then, the 'Rienzi' experience marked the primal scene of his political career. Hitler’s love of music was intense, - fanatical even. But as in painting, his taste was limited to a specific type. Wilhelm Furtwängler learned this to his shock at a long meeting with the Führer in August 1933. 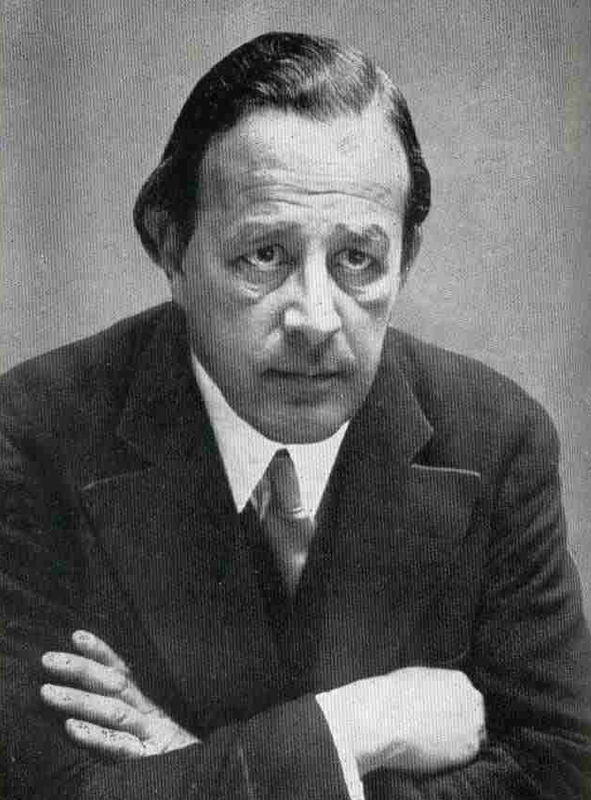 Wilhelm Furtwängler (January 25, 1886 – November 30, 1954) was a German conductor and composer. He is widely considered to have been one of the greatest symphonic and operatic conductors of the 20th century. During the 1920s and 1930s, Furtwängler became one of the leading conductors in Europe, as principal conductor of the Berlin Philharmonic from 1922, as principal conductor of the Gewandhaus Orchestra from 1922–26, and as a major guest conductor of other leading orchestras such as the Vienna Philharmonic. He was the leading conductor who remained in Germany during the Second World War. Music, Hitler left him in no doubt, meant opera, and opera meant Wagner and Puccini. 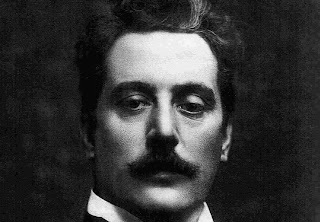 Giacomo Antonio Domenico Michele Secondo Maria Puccini (22 December 1858 – 29 November 1924), generally known as Giacomo Puccini, was an Italian composer whose operas are among the most frequently performed in the standard repertoire. Puccini has been called "the greatest composer of Italian opera after Verdi". While his early work was rooted in traditional late-19th-century romantic Italian opera, he successfully developed his work in the 'realistic' verismo style, of which he became one of the leading exponents. Symphonies - initially - held little interest, and chamber music none at all. There is no record of his ever having attended a chamber concert or a lieder recital. His attendance at symphony concerts was increasingly rare as time passed and, when chancellor, he seldom appeared except on ceremonial occasions. He wanted music to be readily available, however, and after 1933 built up a large collection of phonograph recordings at the Chancellery in Berlin, at the Berghof, on his train and, later on, at his military headquarters on the Eastern front. According to all accounts, these were outstanding in quality and quantity, and the playing equipment was excellent. In the evenings he enjoyed hearing short excerpts and dramatic highlights of favourite pieces. ‘He would then sit back,’ according to Christa Schroeder, and listen with his eyes closed. Christa Schroeder (born Emilie Christine Schroeder; March 19, 1908 – June 18, 1984) was one of Nazi dictator Adolf Hitler’s personal secretaries before and during World War II. It was always the same recordings that were played, and usually the guests knew the number of the record by heart. When Hitler said, for example, ‘Aida, last act: 'The fatal stone upon me now is closing’, then one of the guests would shout the catalogue number to a member of the household staff. ’‘Before long,’ according to Speer, ‘the order of the re-cords became virtually fixed. All the while he would try to guess the names of the singers and, as Speer remarked, ‘was pleased when he guessed right, as he frequently did’. 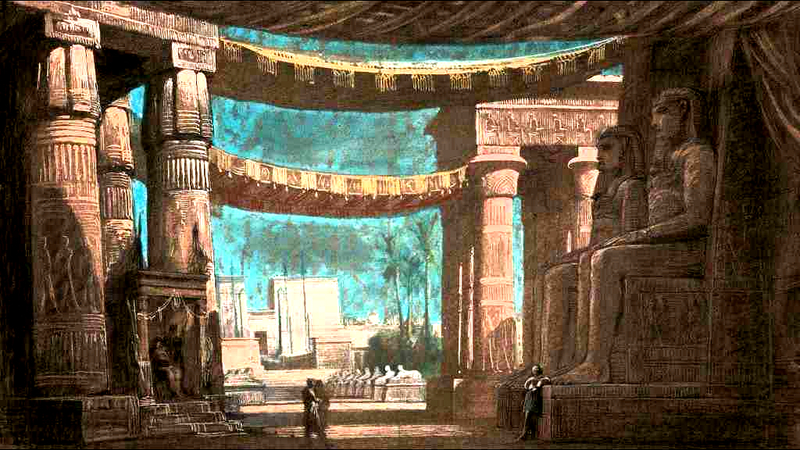 Aida - sometimes spelled Aïda - is an opera in four acts by Giuseppe Verdi to an Italian libretto by Antonio Ghislanzoni, based on a scenario often attributed to French Egyptologist Auguste Mariette. 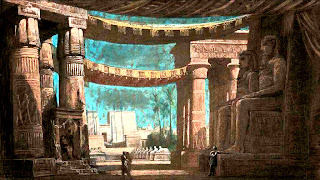 Aida was first performed at the Khedivial Opera House in Cairo on 24 December 1871, conducted by Giovanni Bottesini. Hitler was not genuinely fond of Beethoven and, as time passed, his attendance at performances of his symphonies was usually confined to official events. 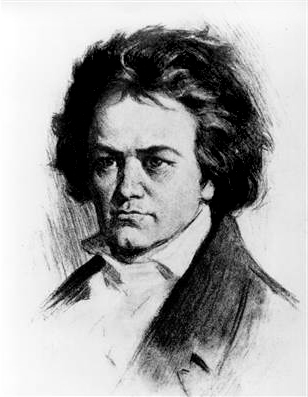 Traditionally Germans looked upon Beethoven along with Goethe, Rembrandt and Shakespeare as the supreme figures of modern Western culture. Unlike the others, however, Beethoven was never just a cultural figure, but also an ideological symbol, invoked by every political movement. National Socialists, Rosenberg in particular, claimed the composer as an Aryan hero - and his music as an elixir that would contribute to the nation’s renewal. In his speeches Hitler consequently felt obliged to give the composer his due, but his praise rarely rose above the perfunctory. So if Hitler had his Wagner, the Party had its Beethoven. When Hitler ‘entertained’ on state occasions, Wagner was performed; when the party ‘entertained’ on party occasions Beethoven was played. And played he was, more often than any other symphonic composer. His works, above all the Ninth Symphony, were the pre-eminent musical set pieces for important occasions. 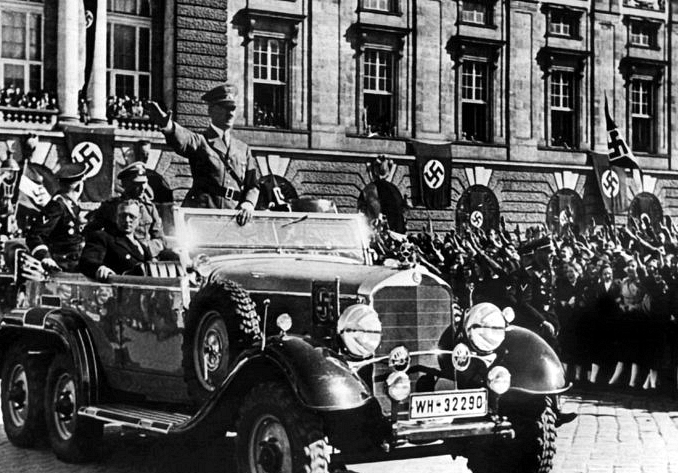 When Hitler wanted to impress state visitors, he hauled them off to a gala performance of a Wagnerian opera. In 1938, anxious to gain Hungarian support for his impending dismemberment of Czechoslova-kia; he invited the Prince Regent, Admiral Horthy, to make a state visit. 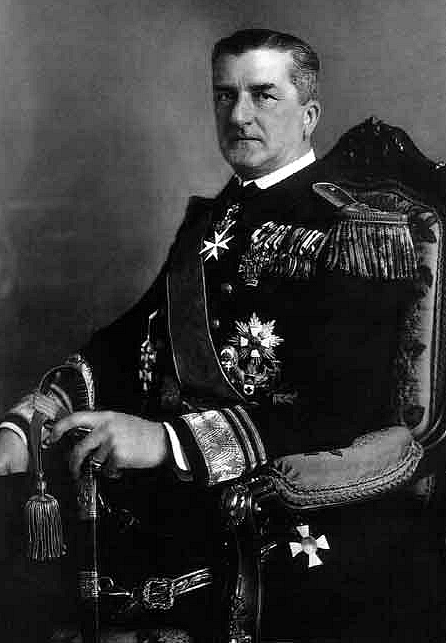 Miklós Horthy de Nagybánya (German: Nikolaus von Horthy und Nagybánya; 18 June 1868 – 9 February 1957) was regent of the Kingdom of Hungary during the years between World Wars I and II and throughout most of World War II, serving from 1 March 1920 to 15 October 1944. He was styled "His Serene Highness the Regent of the Kingdom of Hungary" (Ő Főméltósága a Magyar Királyság Kormányzója). The social high point of the occasion was a stunning performance of 'Lohengrin' - a rather tactless choice considering the opera opens with a call to arms to defend Germany from the Hungarian invader. 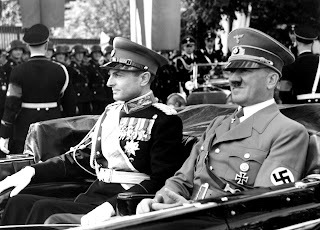 The following year Prince Paul, Prince Regent of Yugoslavia, was invited to Berlin for similar reasons, in this case the imminent invasion of Poland. He was treated to the happier 'Meistersinger von Nürnberg'. Prince Paul of Yugoslavia, also known as Paul Karađorđević (Павле Карађорђевић, - 27 April 1893 – 14 September 1976), was regent of Yugoslavia during the minority of King Peter II. Peter was the eldest son of his first cousin Alexander I. His title in Yugoslavia was "Његово Краљевско Височанство, Кнез Намесник", (His Royal Highness The Prince Regent). In 1939, Prince Paul, as acting head of state, accepted an official invitation from Adolf Hitler and spent 9 days in Berlin. Hitler apparently believed that outstanding musical performances - like his magnificent works of architecture - would leave foreign leaders in awe of the greatness of the Third Reich and incline them to support his policies. Brahms he did not like. 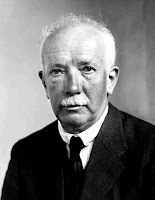 Hitler’s admirers, such as Hans Severus Ziegler and Furtwängler, traced his antipathy to the old rivalry between the Brahms and Bruckner camps in Vienna. 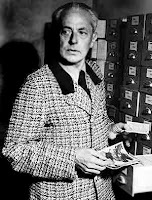 Hans Severus Ziegler (13 October 1893 – 1 May 1978) was a German publicist, intendant, teacher and National Socialist Party official. A leading cultural director under the Nazis, he was closely associated with the censorship and cultural co-ordination of the Third Reich. 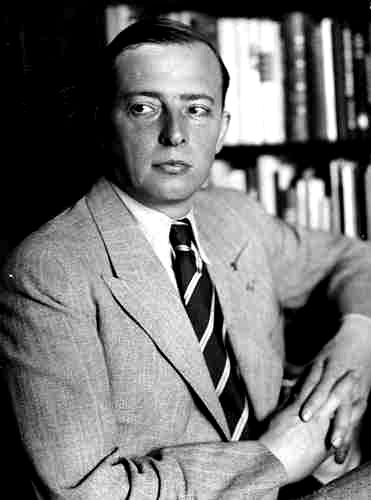 Ziegler played a leading role in promoting the Nazi vision of culture, particularly with regards to "degenerate" music. He was a strong critic of atonality, dismissing it as decadent "cultural Bolshevism"
In an attempt to have him overlook history, and concentrate on the music, they persuaded him to attend a concert of the Berlin Philharmonic, which included the Brahm's Fourth Symphony. But when he blithely commented afterwards, ‘Well, Furtwängler is such a good conductor that under such a baton even Brahms is impressive,’ they admitted defeat. Born in Hamburg into a Lutheran family, Brahms spent much of his professional life in Vienna, Austria, where he was a leader of the musical scene. In his lifetime, Brahms's popularity and influence were considerable; following a comment by the nineteenth-century conductor Hans von Bülow, he is sometimes grouped with Johann Sebastian Bach and Ludwig van Beethoven. Unfortunately the record is silent on what Hitler thought of Richard Strauss’s operas, or even which ones he knew. 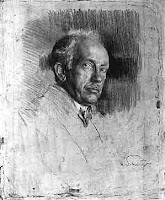 Richard Georg Strauss (11 June 1864 – 8 September 1949) was a leading German composer of the late Romantic and early modern eras. He is known for his operas, which include 'Der Rosenkavalier' and 'Salome'; his lieder, especially his 'Four Last Songs'; and his tone poems and other orchestral works, such as 'Death and Transfiguration', 'Also sprach Zarathustra', 'An Alpine Symphony', and 'Metamorphosen'. Strauss was also a prominent conductor throughout Germany and Austria. Strauss represents the late flowering of German Romanticism after Richard Wagner, in which pioneering subtleties of orchestration are combined with an advanced harmonic style. The story that Hitler begged money from relatives to attend the Austrian premiere of 'Salome' in Graz in May 1906, an event that also drew most of the eminent composers of the day, is possibly apocryphal. Salome, Op. 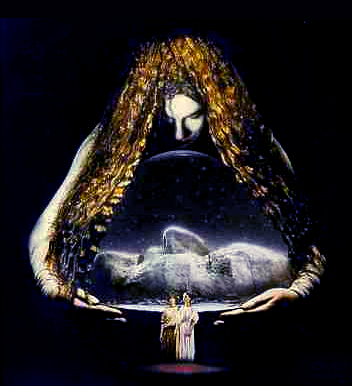 54, is an opera in one act by Richard Strauss to a German libretto by the composer, based on Hedwig Lachmann's German translation of the French play Salomé by Oscar Wilde. 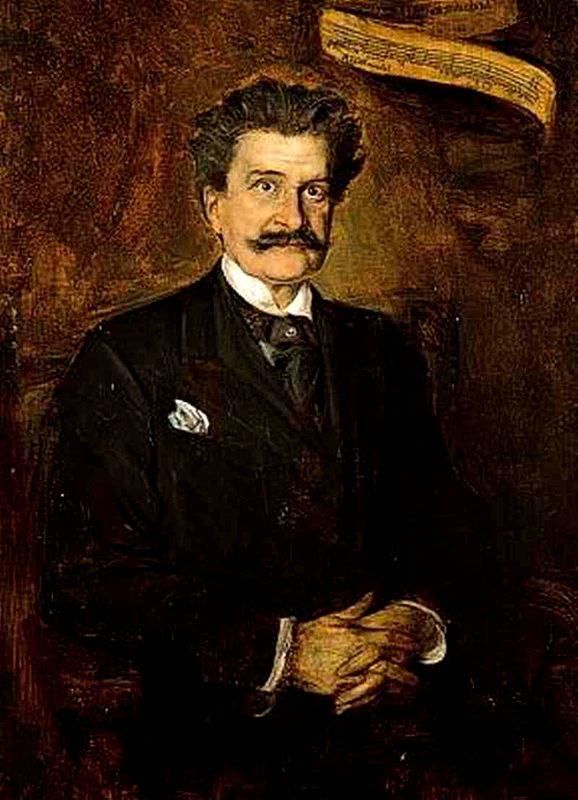 Strauss dedicated the opera to his friend Sir Edgar Speyer. Not until after the Anschluss in 1938 did he even visit the Vienna. Hitler liked the best known operas of Verdi and Puccini. In fact, a performance of 'Madama Butterfly' at the Berlin Volksoper in 1937 left him so delighted that he decided then and there to donate 100,000 marks a year to the opera company. Even so, when once attending a performance of 'La Boheme', what he talked about during the intermissions was Wagner and Bayreuth. Otherwise there were few if any non-German composers whose works he could abide. According to Heinrich Hoffmann, he especially disliked Stravinsky and Prokofiev, and when Hoffmann’s daughter, Henriette von Schirach, presented him with a recording of Tchaikovsky’s Sixth Symphony, he brusquely refused to listen to it. Heinrich Hoffmann (September 12, 1885 – December 11, 1957) was a German photographer best known for his many published photographs of Adolf Hitler. Hoffmann married Therese "Lelly" Baumann, who was very fond of Hitler, in 1911, their daughter Henriette ("Henny") was born on February 3, 1913 and followed by a son, Heinrich ("Heini") on October 24, 1916. Henriette married Reichsjugendführer (National Hitler Youth commander) Baldur von Schirach, who provided introductions to many of Hoffmann's picture books, in 1932. Therese Hoffmann died a sudden and unexpected death in 1928. 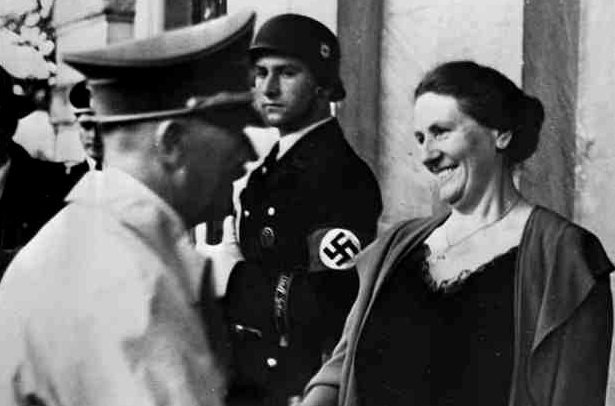 Hoffmann and his second wife Erna introduced his Munich studio assistant Eva Braun to Hitler. Braun later became Hitler's female companion. Hitler liked his music to be melodic, euphonious and accessible. Hitler’s taste underwent several significant changes, however. During most of his life, Bruckner held little appeal. 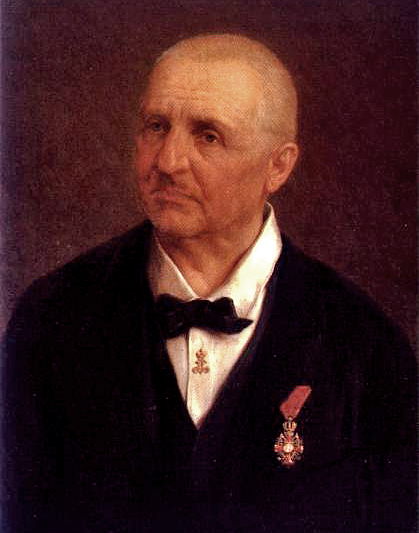 Unlike other musical radicals, such as Richard Wagner or Hugo Wolf who fit the 'enfant terrible' mould, Bruckner showed extreme humility before other musicians, Wagner in particular. 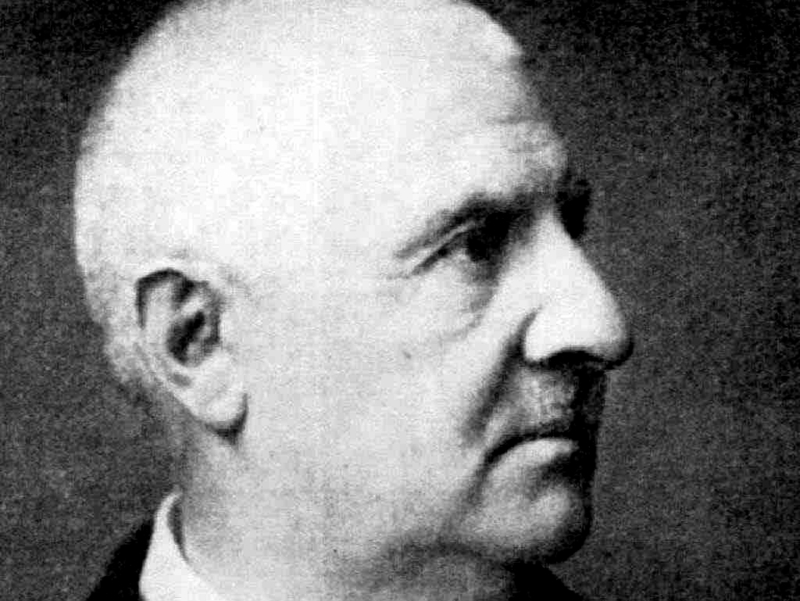 This apparent dichotomy between Bruckner the man and Bruckner the composer hampers efforts to describe his life in a way that gives a straightforward context for his music. Hoffmann did not so much as mention the composer’s name when once identifying Hitler’s favourites. Even after becoming chancellor, Speer noted, his interest ‘never seemed very marked’. The composer had, however, symbolic importance to him, both as a ‘home town boy’ and as a rival to Brahms, so beloved in Vienna. It was a fixed part of the Nuremberg rallies for the cultural session to open with a movement of one of his symphonies. In June 1937 he was famously photographed paying his respects to the composer, standing in mute homage before a monument at ‘Valhalla hall of fame’ near Regensburg as Siegmund von Hausegger and the Munich Philharmonic played the magnificent Adagio of the Seventh Symphony. Why Hitler staged that event is not known. 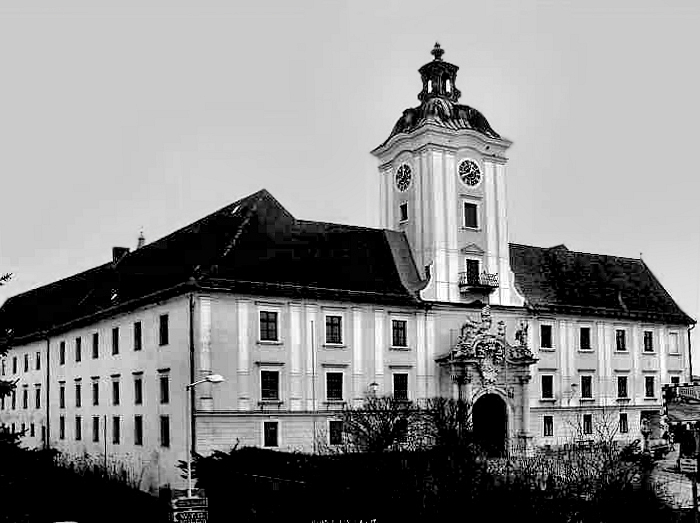 Speculation has ranged from the theory that it was intended as a cultural precursor of the annexation of Austria the following year, to the notion that it was out of nostalgia for his ‘beautiful time as a choirboy’ and Lembach Abbey - with its Bruckner associations. Undoubtedly the Hitler felt a personal kinship. Both had come from small Austrian towns, grew up in modest circumstances, had fathers who died at an early age, were autodidacts, and made their way in life despite great obstacles. On a number of occasions he contrasted the Austrian Catholic Bruckner, whom the Viennese shunned, to the north German Protestant Brahms, whom they idolized. Then, suddenly in 1940 he developed a passion for Bruckner’s symphonies. He even began mentioning him in the same breath with Wagner. 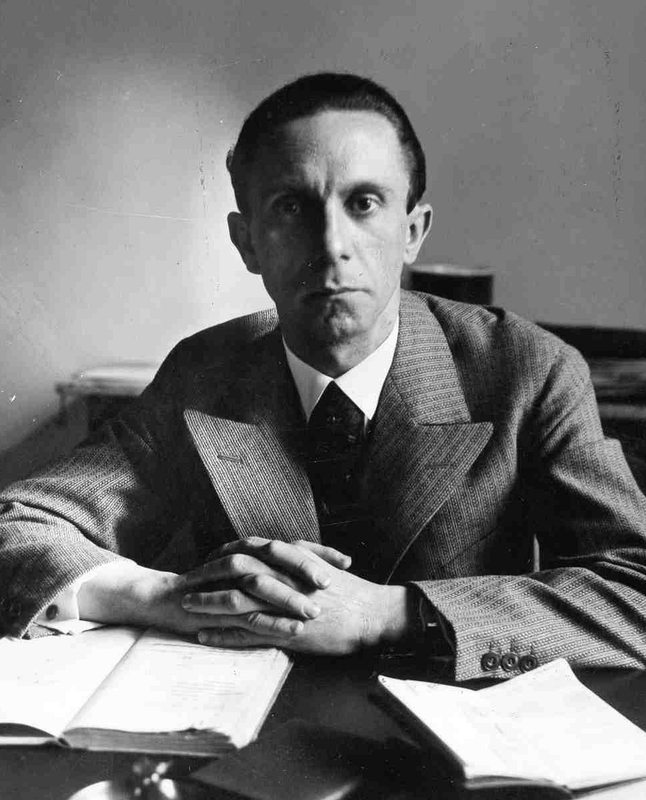 Paul Joseph Goebbels (29 October 1897 – 1 May 1945) was a German politician and Reich Minister of Propaganda in Nazi Germany from 1933 to 1945. 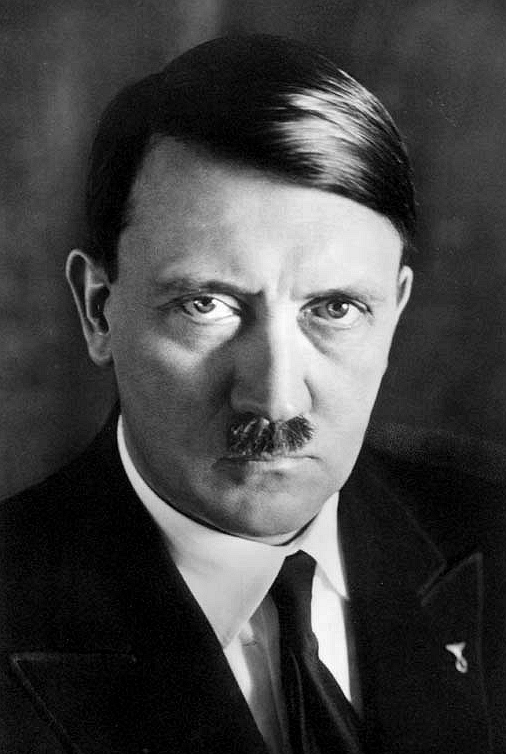 He one of Adolf Hitler's closest associates and most devout followers. By 1942 he placed Bruckner on a level with Beethoven, and categorized the former’s Seventh Symphony as ‘one of the most splendid manifestations of German musical creativity, the equivalent of Beethoven’s Ninth’. 'Those are pure popular melodies from Upper Austria, nothing taken over literally but ländler and so on that I know from my youth. What the man made out of this primitive material ! In this case it was a priest who deserves well for having supported a great master. The bishop of Linz sat for hours alone in the cathedral when Bruckner, the greatest organist of his time, played the organ. 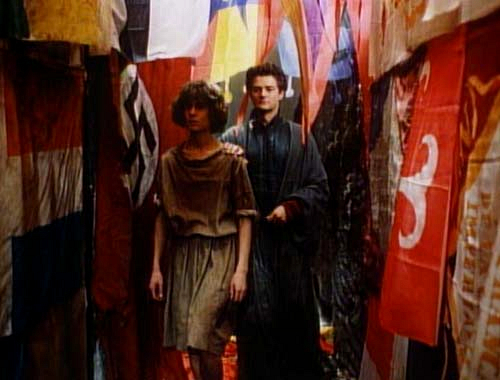 One can imagine how difficult it was for a small peasant lad when he went to Vienna, that urbanized, debauched society. 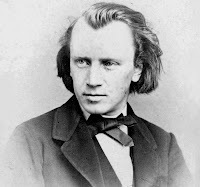 A remark by him about Brahms, which a newspaper recently carried, brought him closer to me: Brahms’s music is quite lovely, but he preferred his own. That is the healthy selfconfidence of a peasant who is modest but when it came down to it knew how to promote a cause when it was his own. That critic Hanslick made his life in Vienna hell. But when he could no longer be ignored, he was given honours and awards. But what could he do with those? It was his creative activity that should have been made easier. From then on Hitler did everything possible to promote Bruckner and to enlist him in his vendetta against Vienna. St Florian, where the composer’s career had begun, was to be turned into a pilgrimage site in the manner of Bayreuth. Accordingly, Hitler financed a centre of Bruckner studies there, had the famous organ repaired and augmented the composer’s library. He even designed a monument in his honour to stand in Linz, and endowed a Bruckner Orchestra which he was determined to make one of the world’s best. The publication of the Haas edition of the composer’s original scores was subsidized from his own funds. And he dreamed of constructing a bell tower in Linz with a carillon that would play a theme from the Fourth Symphony. 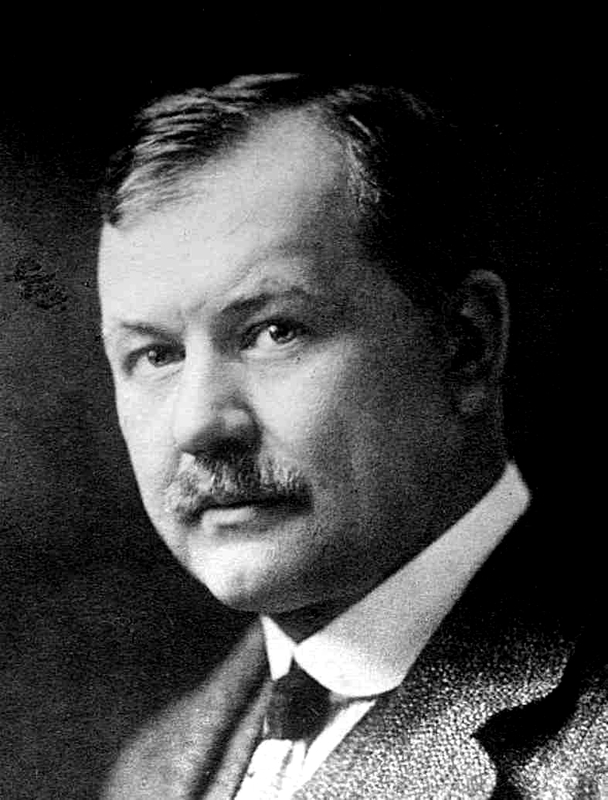 Franz Lehár (30 April 1870 – 24 October 1948) was an Austro-Hungarian composer. He is mainly known for his operettas of which the most successful and best known is The Merry Widow (Die lustige Witwe). 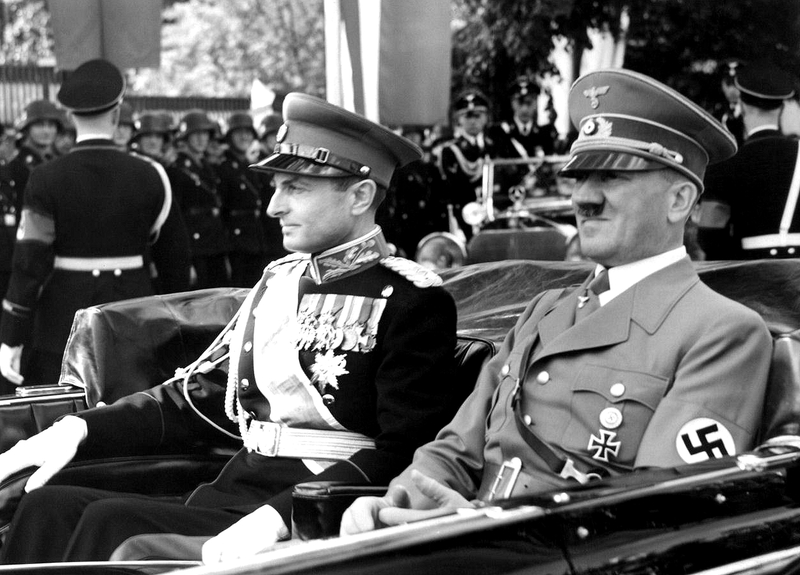 Hitler enjoyed Lehár's music, and hostility diminished across Germany after Goebbels's intervention on Lehár's part. The National Socialist regime was aware of the uses of Lehár's music for propaganda purposes: concerts of his music were given in occupied Paris in 1941. Even so, Lehár's influence was limited. 'Die lustige Witwe' is an operetta by the Austro–Hungarian composer Franz Lehár. The librettists, Viktor Léon and Leo Stein, based the story – concerning a rich widow, and her countrymen's attempt to keep her money in the principality by finding her the right husband – on an 1861 comedy play, L'attaché d'ambassade (The Embassy Attaché) by Henri Meilhac. There was a remarkable irony in this. Although Hitler almost always avoided mentioning the names of contemporary composers and their works, in speeches in 1920 and 1922 he singled out 'Die lustige Witwe' as a pre-eminent example of artistic kitsch. There is no way of knowing when he changed his mind. But some time in the 1930s that very opera became one of his favourites. He never missed a new production of either that or Johann Strauss’s 'Fledermaus', and drew large sums from his private account for lavish new stagings. Among his operettas, 'Die Fledermaus' and 'Der Zigeunerbaron' are the best known. Eventually Hitler came to revere Lehar as one of the greatest of composers. So thrilled was he upon meeting the composer in 1936 at a session of the Reichskulturkammer that he talked about the experience for days afterwards. 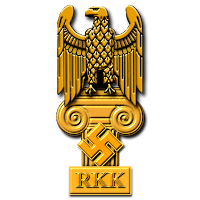 The Reichskulturkammer (RKK) ("Reich Chamber of Culture") was an institution in the Third Reich. 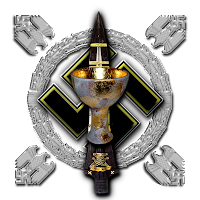 It was established by law on 22 September 1933 in the course of the 'Gleichschaltung' (meaning "coordination", "making the same", "bringing into line") process at the instigation of Reich Minister Joseph Goebbels as a professional organization of all German creative artists. 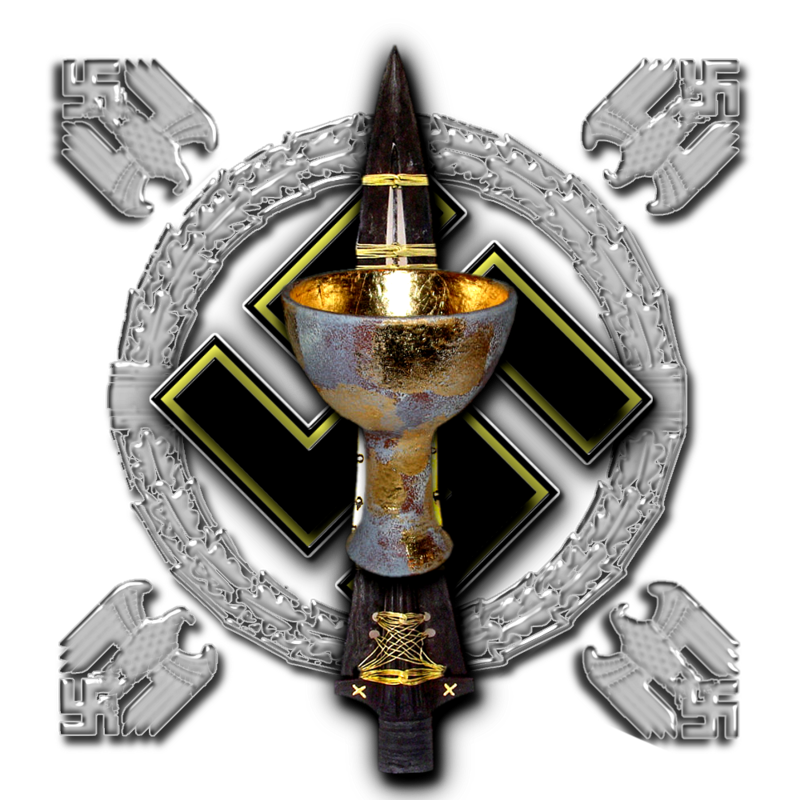 Defying the claims raised by the German Labour Front (DAF) under rival Robert Ley, it was designed to control the cultural life in Germany, promoting art created by "Aryans", and seen as consistent with National Socialist ideals. Every artist had to apply for membership on presentation of an 'Aryan certificate'. The RKK was affiliated with the Ministry of Public Enlightenment and Propaganda with its seat in Berlin and was headed by Dr Paul Joseph Goebbels. The importance of Lehar’s music in the last years of his life was evident when he celebrated his birthday in 1943 by treating himself, and his guests, to a recording of 'Die lustige Witwe'. Clearly Hitler had a keen ear, but how much did he actually know about music ? He possessed a powerful memory, and in fields that interested him he often befuddled specialists with his detailed, even expert, knowledge. In fact, confounding professionals, and showing off to his entourage, gave him wicked pleasure, and those around him occasionally suspected that he boned up on a topic only to bring the conversation round to it so that he could exhibit his ‘extraordinary knowledge’. While confirming the story, Hotter commented that it was difficult to draw much of a conclusion from it. ‘Hitler had an exception-ally good memory. Richard Georg Strauss (11 June 1864 – 8 September 1949) was a leading German composer of the late Romantic and early modern eras. He is known for his operas, which include 'Der Rosenkavalier' and 'Salome'; his lieder, especially his 'Four Last Songs'; and his tone poems and other orchestral works, such as 'Tod und Verklärung', 'Also sprach Zarathustra', 'Eine Alpensinfonie' and Metamorphosen. Strauss was also a prominent conductor throughout Germany and Austria. Friedenstag (Peace Day) is an opera in one act by Richard Strauss, his Opus 81, to a German libretto by Joseph Gregor. The opera was premiered at Munich on 24 July 1938 and dedicated to Viorica Ursuleac and her husband Clemens Krauss, the lead and conductor respectively. 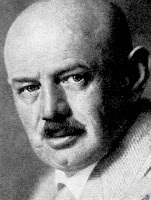 Strauss had intended 'Friedenstag' as part of a double-bill, to be conducted by Karl Böhm in Dresden, that would include as the second part his next opera 'Daphne'. Most accounts of his musical expertise relate to his knowledge of Wagnerian opera. Typical was a comment of Winifred Wagner (see above) who, as her secretary recorded, ‘could not stop raving about what an attentive listener he is and how well he knows the works, above all musically’. 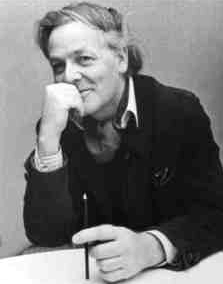 In the same vein, Heinz Tietjen remarked that he was ‘amazed’ at how well the Führer knew Wagner’s scores, citing as an example Hitler’s comment after a performance that the oboe had not played quite in tune. ‘And I had to acknowledge he was right,’ the impresario said. 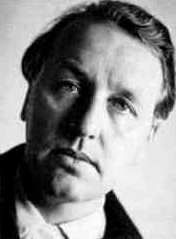 Heinz Tietjen (June 24, 1881 - November 30, 1967) was a German conductor and music producer. More convincing are the comments of Baldur von Schirach. Writing after he had served twenty years in Spandau, he cannot be suspected of gilding the lily. He recalled a performance of 'Die Walküre', which Hitler had attended in Weimar in 1925. Schirach’s father was managing director of the opera house and, after the performance, Hitler was introduced to him and went on at great length about what he had seen and heard in a way that demonstrated he really knew his Wagner. He compared the production with those he had attended in Vienna as a young man, naming singers and conductors, and so impressed the elder Schirach that he was invited home to tea. 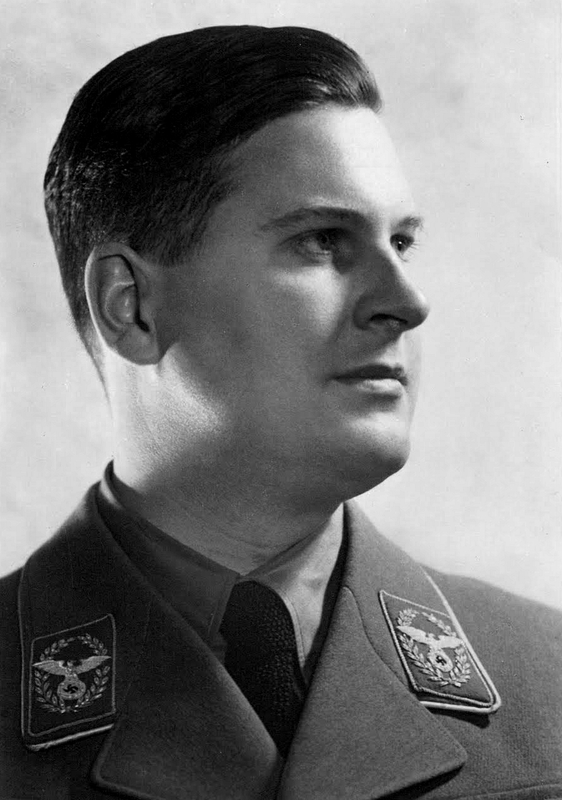 Baldur Benedikt von Schirach (9 May 1907 – 8 August 1974) was a Nazi youth leader later convicted of crimes against humanity. He was the head of the Hitler-Jugend (HJ, the "Hitler Youth") and Gauleiter and Reichsstatthalter ("Reich Governor") of Vienna. Schirach was born in Berlin, the youngest of four children of theatre director Rittmeister Carl Baily Norris von Schirach (1873–1948) and his American wife Emma Middleton Lynah Tillou (1872–1944). Through his mother, Schirach descended from two signatories of the United States Declaration of Independence. He had two sisters, Viktoria and Rosalind von Schirach, and a brother, Karl Benedict von Schirach, who committed suicide in 1919 at the age of 19. Berthold Konrad Hermann Albert Speer - March 19, 1905 – September 1, 1981 - was a German architect who was, for a part of World War II, Minister of Armaments and War Production for the Third Reich. Speer was Adolf Hitler's chief architect before assuming ministerial office. 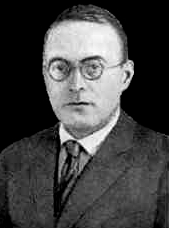 Speer joined the Nazi Party in 1931, launching him on a political and governmental career which lasted fourteen years. His architectural skills made him increasingly prominent within the Party and he became a member of Hitler's inner circle. Hitler instructed him to design and construct a number of structures, including the Reich Chancellery and the Zeppelinfeld stadium in Nuremberg where Party rallies were held. Speer also made plans to reconstruct Berlin on a grand scale, with huge buildings, wide boulevards, and a reorganized transportation system. Which were Hitler's favourite operas ? Despite the poverty of his Vienna years, he managed to attend 'Tristan und Isolde' alone thirty or forty times, and in the course of his life heard it, and 'Die Meistersinger', probably a hundred times. 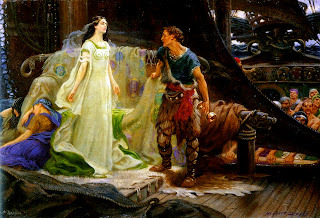 'Tristan und Isolde' is an opera, or music drama, in three acts by Richard Wagner to a German libretto by the composer, based largely on the romance by Gottfried von Straßburg. It was composed between 1857 and 1859 and premiered in Munich on 10 June 1865 with Hans von Bülow conducting. 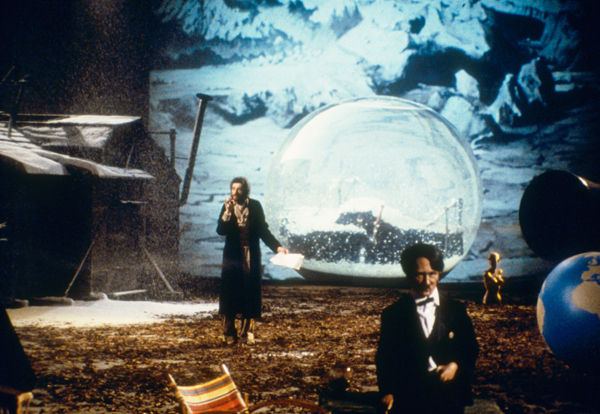 Wagner referred to the work not as an opera, but called it "eine Handlung" (literally a drama. a plot or an action). Wagner's composition of 'Tristan und Isolde' was inspired by his affair with Mathilde Wesendonck and the philosophy of Arthur Schopenhauer. Widely acknowledged as one of the peaks of the operatic repertory, 'Tristan' was notable for Wagner's advanced use of chromaticism, tonality, orchestral colour and harmonic suspension. According to his press chief, Otto Dietrich, he knew 'Die Meistersinger' by heart and could hum or whistle all its themes. 'Lohengrin' no doubt held a special place in his heart. 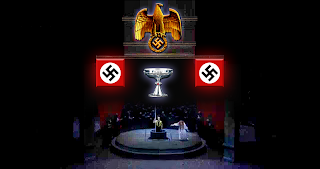 According to Fest, Hitler considered the final scene of 'Götterdämmerung' to be ‘the summit of all opera’. 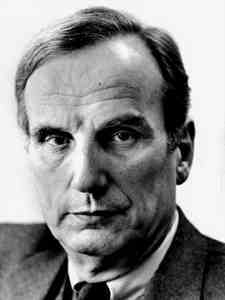 Joachim Clemens Fest (8 December 1926 – 11 September 2006) was a German historian, journalist, critic and editor, best known for his writings and public commentary on Nazi Germany, including an important biography of Adolf Hitler and books about Albert Speer. Be that as it may, it was 'Tristan and Isolde' that meant most to him. According to Christa Schroeder, the 'Liebestod' moved him so deeply that he said he wished to hear it at the time of his death. And in a letter from Landsberg prison in 1924 he wrote that he often ‘dreamed of Tristan’. There is no way of knowing whether it was the eroticism, the sense of longing, the triumph of sensuality over reason that - in contrast to his own repressed sexual instincts - appealed to him. Possibly it was the cult of the night or the tragic end. 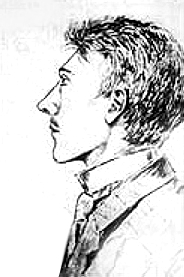 'Tannhäuser' engaged him less, and he was long familiar only with the composer’s earliest score, the so-called 'Dresden Version'. At some point in the 1930s he heard the later 'Paris Version', and was so taken with it that he ordered Goebbels and Goring to permit only that score to be performed. Despite the fact that Hitler seemed to favour 'Tristan' the most significant of Wagner's works for Hitler, despite his comments about 'Tristan' and 'Götterdämmerung', was 'Parsifal' - and that was the reason he wanted Roller to re-stage it at Bayreuth. And this elucidates Hans Frank’s story that, while riding on his train through the Rhineland in 1936, Hitler asked to have played for him a recording of Karl Muck’s performance of the Parsifal Vorspiel. He recalled that the Vienna opera archive held sketches of Roller’s 1914 production and he commended these as models for producers. Not waiting for the final victory, Goebbels passed on the word to his ministerial officials with instructions to have photographs of the Roller sketches circulated to every opera house. Managers were informed that any future staging of the work was to follow the Roller model and ‘was no longer to be done in the Byzantine-sacred style that was common up to then’. 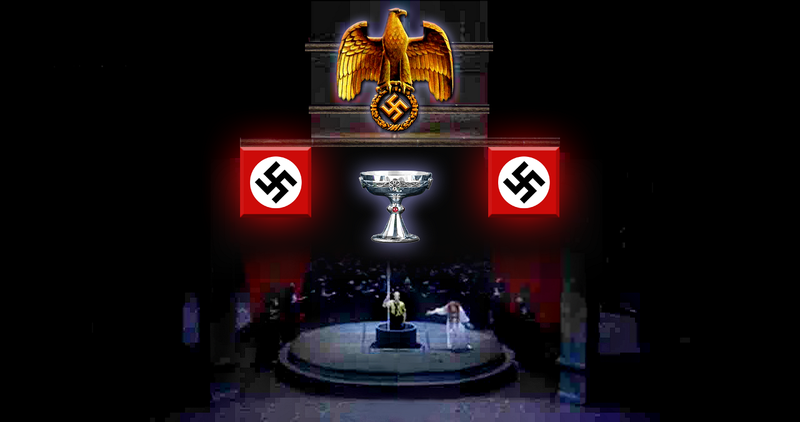 For Hitler the Gnostic themes of the Grail Quest, and the cosmic struggle between Light and Darkness were perfectly portrayed in 'Parsifal'. 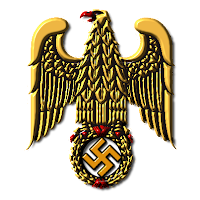 Being an occult initiate, Hitler was aware of the Gnostic message behind "the externals of the story, with its Christian embroidery... the real message was pure, noble blood, in whose protection and glorification the brotherhood of the initiated have come together." "I have built up my religion out of Parsifal. 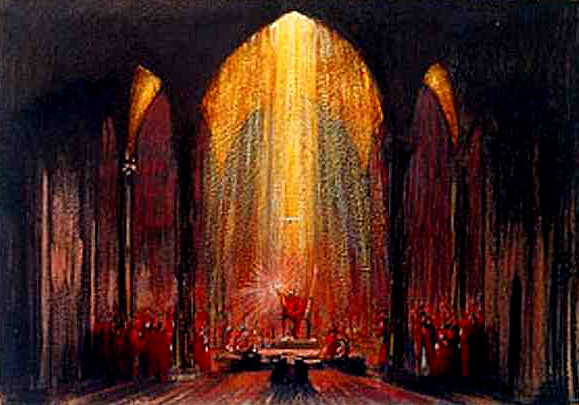 Divine worship in solemn form ... without pretenses of humility ... One can serve God only in the garb of the hero"
'What is celebrated in Wagner's 'Parsifal' is not the Christian religion of compassion, but pure and noble blood, - blood whose purity the brotherhood of initiates has come together to guard. The king (Amfortas) then suffers an incurable sickness, caused by his tainted blood. 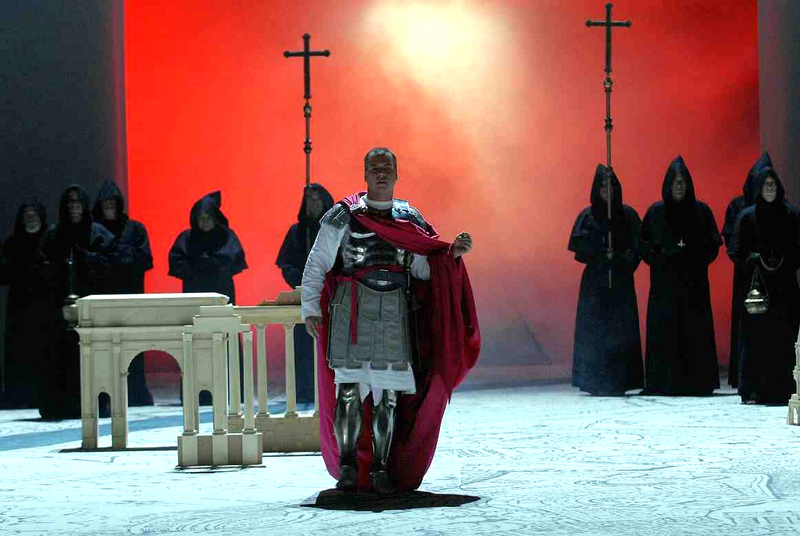 Then the unknowing but pure human being (Parsifal) is led into temptation, either to submit to the frenzy and to the delights of a corrupt civilisation in Klingsor's magic garden, or to join the select band of knights who guard the secret of life, which is pure blood itself. All of us suffer the sickness of miscegenated, corrupted blood. Note how the compassion that leads to knowledge applies only to the man who is inwardly corrupt, to the man of contradictions. And Eternal life, as vouchsafed by the Grail, is only granted to those who are truly pure and noble ! Only a new nobility can bring about the new culture. If we discount everything to do with poetry, it is clear that elitism and renewal exist only in the continuing strain of a lasting struggle. A divisive process is taking place in terms of world history. The man who sees the meaning of life in conflict will gradually mount the stairs of a new aristocracy. He who desires the dependent joys of peace and order will sink back down to the unhistorical mass, no matter what his provenance. But the mass is prey to decay and self-disintegration. At this turning- point in the world's revolution the mass is the sum of declining culture and its moribund representatives. "The old beliefs will be brought back to honor again. The whole secret knowledge of nature, of the divine, the demonic. We will wash off the Christian veneer and bring out a religion peculiar to our race." 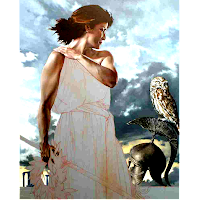 It has sometimes been assumed that Hitler was attracted to Wagner’s works because of the plots, with their classic conflict between the outsider and a rigid social order, their lonely heroes and dark villains, their Nordic myths and Germanic legends. 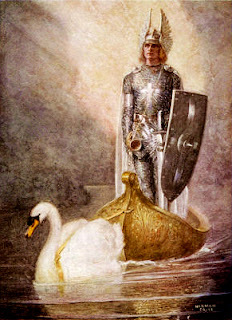 However, (apart from 'Parsifal' - see above) there is no record of any comment on how he interpreted the works, or whether he saw in them any ideological message - much less whether he envisaged himself as Lohengrin, Siegmund, Siegfried, Wotan or any other Wagnerian character. It was the music that moved him. 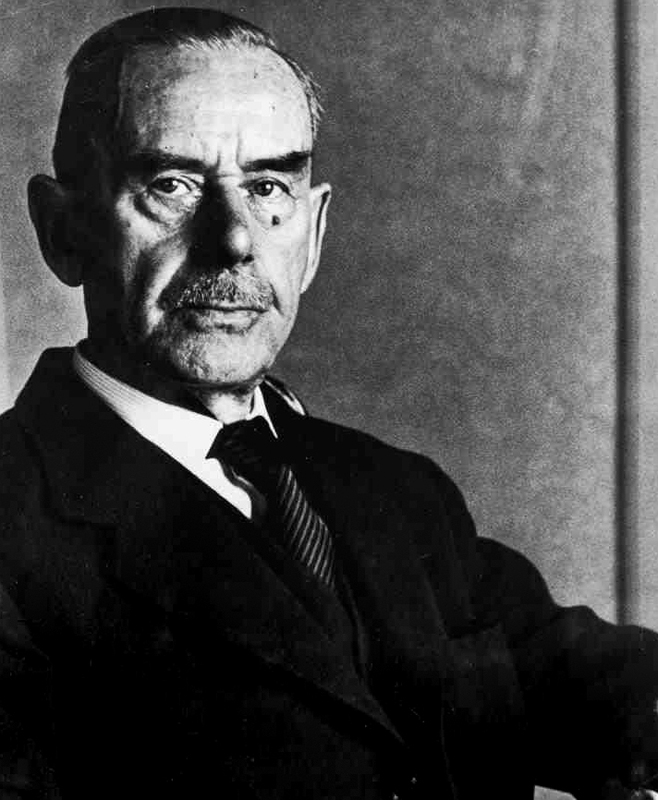 Perhaps he was trying to say what Thomas Mann wrote in 'Dr Faustus' - that the elements of music are the first and simplest materials of the world, and make music one with the world, that ‘the beginning of all things had its music’. Christa Schroeder recalled his saying that ‘Wagner’s musical language sounded in his ear like a revelation of the divine’. The vocabulary suggests that the feelings conjured by the operas may have filled the void left by the conventional Catholic religious belief he lost, or never really had - and it is quite clear that Hitler saw 'Parsifal' in religious terms. In one of his earliest speeches he made the revealing comment that in their way Wagner’s works were holy, that they offered ‘exaltation and liberation from all the wretchedness and misery as well as all the decadence that prevails’, and that they lift one ‘up into the pure air’. If escape and purification were part of the appeal, the operas also responded to that proclivity for the overwhelming, the oceanic, the romantic, the orgasmic that was evident in his public rallies, parades and spectacles. Like Wagner himself, Hitler believed that music fully realized itself only when it fused with other arts in visible form on stage. down to the fabric and design of the theatre itself. 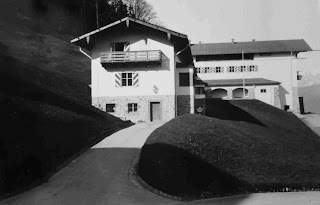 Hans Severus Ziegler recalled taking a walk with Hitler one night at the Berghof, when the moon suddenly appeared from behind a cloud and lit the surrounding meadow. Hitler stopped in his tracks and launched into a discussion of the colour of light necessary to achieve verisimilitude for moonlight on a stage, as in the concluding scene of the second act of 'Die Meistersinger'. 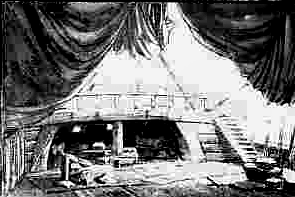 Already in his youth Hitler had made sketches of Wagnerian stage sets that he imagined or actually saw. Although a drawing of Siegfried holding a raised sword is a Kujau forgery, several authentic sketches survive. Among them is one of the second act of 'Lohengrin'; others include his rendering of the second and third acts of the famous 1903 Mahler-Roller production of 'Tristan and Isolde', which he had attended in Vienna. This interest in stage design increased after he became chancellor, and reached such a level that it was common knowledge that the best way to get an appointment with him, which otherwise might take months, was to let him know that you had photos of a new staging of an operetta or opera, particularly Wagnerian. An invitation was almost certain to follow, and then Hitler would spend countless hours studying the pictures. 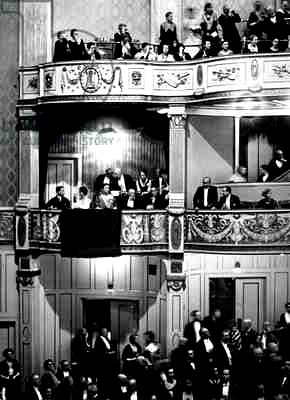 Most of all he relished working with Benno von Arent, and together they designed several productions that he commissioned and paid for with his private funds - among them, 'Lohengrin' in 1935 at the German Opera in Berlin, 'Rienzi' in 1939 at the Dietrich Eckart Open Air Theatre in Berlin and 'Die Meistersinger' in 1934, and later years at the Nuremberg opera in connection with the party rally. Benno von Arent (19 July 1898 – 14 October 1956) was a member of the National Socialist Party and SS, responsible for art, theatres, movies etc. Arent was born in Görlitz, Prussia, on 19 July 1898. Self-taught, after various apprentice positions he obtained his first theater job in Berlin in 1923 and became a stage designer. He joined the SS in 1931 and the NSDAP in 1932. The same year, he was one of the founders of the "Bund nationalsozialistischer Bühnen- und Filmkünstler" ("Union of national-socialist stage and movie artists"), which was renamed "Kameradschaft deutscher Künstler" ("fellowship of German artists") after Hitler's rise to power in 1933. Arent was appointed "Reichsbühnenbildner" ("Reich stage designer") in 1936 and "Reichsbeauftragter für die Mode" ("Reich agent for fashion") in 1939. He designed the diplomatic uniform of the Nazi diplomatic service. 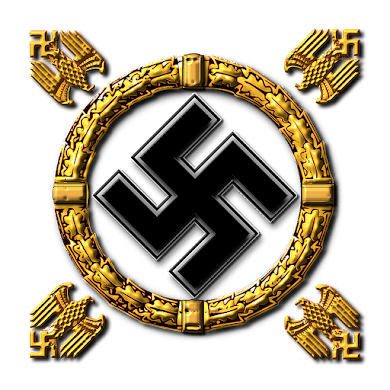 In 1944, he was given the rank of SS-Oberführer. He is listed under 'Kunstlerische Mitarbeiter' in the 1938-39 catalog issued by Porzellan-Manufaktur Allach, Munich. 'At the chancellery Hitler once sent up to his bedroom for neatly executed stage designs, coloured with crayons, for all the acts of 'Tristan and Isolde'; these were to be given to Arent to serve as an inspiration. 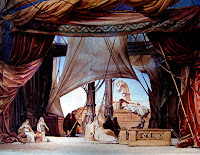 Another time he gave Arent a series of sketches for all the scenes of 'Der Ring des Nibelungen'. At lunch he told us with great satisfaction that for three weeks he had sat up over these, night after night. This surprised me the more because at this particular time Hitler’s daily schedule was unusually heavy with visitors, speeches, sight-seeing and other public activities. Undoubtedly, Arent’s work reflected Hitler’s taste. The main trait of the Hitler-Arent style was, as Speer phrased it, ‘smashing effects’, and Arent’s productions were smashing. Gigantic choruses and parades, huge casts of extras and glitzy costumes characterized 'Lohengrin' and 'Rienzi'. But the Hitler-Arent chef-d’oeuvre was their 1934 joint production of 'Die Meistersinger'. This culminated in a third-act meadow scene staged in the manner of a Nuremberg party rally, with massed banners and martial chorus. No detail of the production escaped Hitler’s eye. He fretted over the moonlight scene in the second act and went into ecstasies over the brilliant colours he wanted for the final scene on the Mastersingers’ meadow, and over the romantic look of the little gabled houses opposite Hans Sachs’s cobbler’s shop. So proud of it was he that he sent it on tour - from Nuremberg to the German Opera in Berlin in 1935, then to Munich in 1936, Danzig in 1938, Weimar in 1939 and Linz in 1941. It even enjoyed a measure of resurrection after the war when the costumes were used in 1951 at the Bayreuth Festival, then too impoverished to afford to make its own. Hitler’s adulation of Wagner-the-composer probably developed into veneration of Wagner-the-man rather quickly. Except for Frederick the Great and Bismarck, on no other person did he lavish such repeated and fulsome praise. ‘I must be frank to say that Richard Wagner’s personality meant more to me than Goethe’s,’ he remarked on one occasion. ‘The Führer talks to me of Richard Wagner, he reveres him and knows of no one like him,’ Goebbels once recorded. He even managed to introduce Wagner’s name into his 1923 putsch attempt, telling the court at his trial that he had been partly inspired by the composer’s example of preferring deeds to words. 'When I stood at Wagner’s grave for the first time my heart just overflowed with pride that here rested a man who would not permit the inscription on his tombstone: ‘Here lies Privy Counsellor, Music Director, His Excellency Baron Richard von Wagner’. In the early 1930s it was being argued that Wagner did not simply enchant Hitler with his music and inspire his anti-Semitism, stagecraft and political ideas, but also that he helped to create the very ideological atmosphere that put him in power. ‘Of all German creative figures, Wagner is the real father of the current German state of mind,’ wrote Emil Ludwig. It was not by chance, he went on, that Hitler was a Wagnerian. The two men were personally alike. Moreover, they worked the same material. The composer took the German sagas just as they were. ‘Such were the ideals that Wagner proffered the German people. But it was not just the stories and the ‘musical sound’ that created a mood of ‘mystical rapture’ but also his use of the German language. These were themes developed in later years by Thomas Mann. The novelist was scarcely less smitten by Wagner than was Hitler himself. He too as a youth had haunted his local opera house, and 'Lohengrin' had also been the first of the Master’s operas he had attended. Mann spoke of the composer as his ‘starkstes, bestimmendes Erlebnis’, his strongest and most formative experience. From the beginning to the end of his life he was enthralled by the music, and bewitched by the man. Wagner was the subject, or important theme, of nearly a dozen essays, any number of letters and countless diary entries. But while Hitler admired everything he knew about the composer’s life, character, ideology and musical creation, Mann was in someways ambivalent about them. Mann’s most important commentary on Wagner was an address to the Goethe Society of Munich in February 1933 on the fiftieth anniversary of the composer’s death. Entitled 'The Sufferings and Greatness of Richard Wagner', it was a deeply searching and astute treatment of Wagner’s place in European culture. The fruit of years of thought, it placed the composer among the greatest of artistic figures. 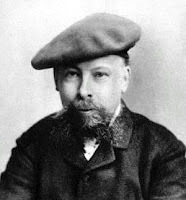 In 1937 Mann noted in his diary that on the one hand that he found ‘elements of a frightening quality’ in a poem Wagner had written for Cosima, and on the other that he had listened to a re-cording of 'Die Walkure' ‘with admiration’. According to Joachim C. Fest 'the youthful Hitler succumbed to the music of Richard Wagner . ... 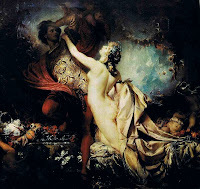 The charged emotionality of this music seemed to have served him as a means for self hypnosis, while he found in its lush air of luxury the necessary ingredients for escapist fantasy . . . . ' Hitler himself in fact later declared that with the exception of Richard Wagner he had ‘no forerunners’, and by Wagner he meant not only the composer but Wagner the personality, ‘the greatest prophetic figure the German people has had’ . . . . The points of contact between the two temperaments - all the more marked because the young painter consciously modelled himself after his hero - produce a curious sense of family resemblance. Joachim Clemens Fest (8 December 1926 – 11 September 2006) was a German historian, journalist, critic and editor, best known for his writings and public commentary on Nazi Germany, including an important biography of Adolf Hitler and books about Albert Speer and the German Resistance. He was a leading figure in the debate among German historians about the Nazi period. The style of public ceremonies in the Third Reich is inconceivable without Wagner’s operatic tradition, without the essentially demagogical art of Richard Wagner - for the 'Master of Bayreuth' was not only Hitler’s great exemplar, he was also the young man’s ideological mentor. Wagner’s political writings were some of Hitler’s favourite reading, and his style unmistakably influenced Hitler’s own grammar and syntax. Those political writings, together with the operas, form much of the framework for Hitler’s ideology . . . . Here he found the ‘granite foundations’ for his view of the world. 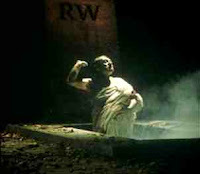 Nothing could have symbolized the association more provocatively than the opening scene of Hans Jürgen Syberberg’s 1977 film, 'Hitler', in which the dictator rises ectoplasmically out of Wagner’s Bayreuth grave. Hans-Jürgen Syberberg (born 8 December 1935) is a German film director, whose best known film is his lengthy feature, 'Hitler: A Film from Germany'. Born in Nossendorf, Pomerania, the son of an estate owner, Syberberg lived until 1945 in Rostock and Berlin. In 1952 and 1953 he created his first 8 mm takes of rehearsals by the Berliner Ensemble. In 1953 he moved to West Germany, where he in 1956 began studies in literature and art history, completing them the following year. He earned his doctorate in Munich. For Syberberg, cinema is a form of Gesamtkunstwerk. 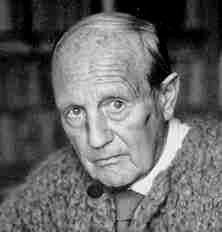 Many commentators, including Syberberg himself, have characterized his work as a cinematic combination of Bertolt Brecht's doctrine of epic theatre and Richard Wagner's operatic aesthetics. Well known philosophers and intellectuals have written about his work, including Susan Sontag, Gilles Deleuze and Philippe Lacoue-Labarthe. In 1975 Syberberg released 'Winifried Wagner und die Geschichte des Hauses Wahnfried von 1914-1975' - a documentary about Winifred Wagner, wife of Richard Wagner's son Siegfried. The documentary attracted attention because it exposed Winifred's admiration for Adolf Hitler. The film thus proved an embarrassment to the Wagner family and the Bayreuth Festival (which she had run from 1930 until the end of the Second World War). Syberberg is also noted for an acclaimed visual interpretation of the Wagner opera 'Parsifal' in 1982. What Hitler admired in the composer was what he admired in his other heroes, courage. In a speech in 1923 he defined the vital quality of human greatness as ‘the heroic’ and attributed it to three men: Luther, Frederick the Great and Wagner - the reformer because he possessed the courage to stand alone against the world, the king because he never lost courage when his lot appeared hopeless and the composer, because he had the courage to struggle in solitude. Each had fought, had fought alone and had fought ‘like a titan’. As a desperately lonely and friendless figure in his early days, Hitler must have seen his own situation mirrored in such struggles. Wagner was thus a symbol or, better, a model of someone who believed in his destiny and let nothing deter him from it. It was no doubt in this sense that he considered the composer, in the oft cited phrase, his only forebear. 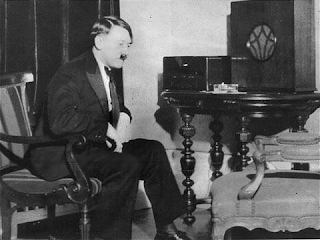 Apart from his remarks about 'Parsifal', Hitler never ascribed any of his views to Wagner, not in 'Mein Kampf', his speeches, articles or recorded private conversations. However, there are many obvious parallels in outlook - anti-Semitism, Hellenism, the belief that culture was the 'summum bonum' of a civilization, the notion that the arts should never be hostage to commerce, and the like. Certainly Wagner’s pamphlet 'Judentum in der Musik' resonates in Hitler’s claim that Jews lack artistic creativity. 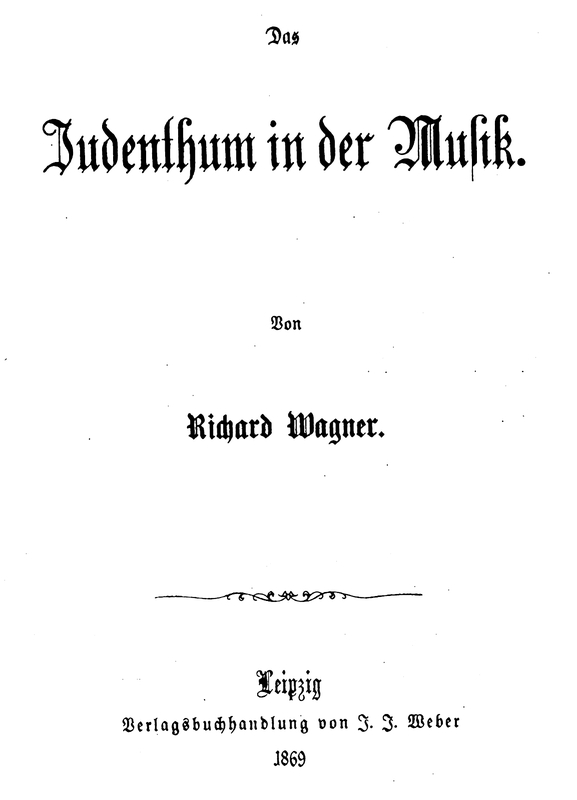 "Das Judenthum in der Musik" ("Jewishness in Music"), is an essay by Richard Wagner which attacks Jews in general, and the composers Giacomo Meyerbeer and Felix Mendelssohn in particular. It was published under a pseudonym in the Neue Zeitschrift für Musik (NZM) of Leipzig in September 1850 and was reissued, in a greatly expanded version, under Wagner’s name in 1869. It is regarded by some as an important landmark in the history of German anti-Semitism. Some critics point out that Wagner's opposition to Jews was not limited to his articles, and that the operas contained such messages. In particular the characters of Mime in the 'Ring', Klingsor in 'Parsifal' and Sixtus Beckmesser in Die Meistersinger' appear to be Jewish stereotypes, although none of them are identified as Jews in the libretto. However, at no time did he ever trace his anti-Semitism to the composer, not even in his 1920 speech ‘Warum sind wir Antisemiten ?’ (Why are We Anti-Semites? ), in which he expounded his views for the first time in public. This is not surprising, as his 'doctrinal' anti-Semitism, was based on Gnostic and occult teachings, originating with Dietrich Eckart. Kubizek does say, however,that the youthful Hitler was said to have read every biography, letter, essay, diary and other scrap by and about his hero that he could lay his hands on. So we are left with the apprehension that Wagner, and in particular his Bühnenweihfestspiel 'Parsifal', was a seminal influence on Adolf Hitler. 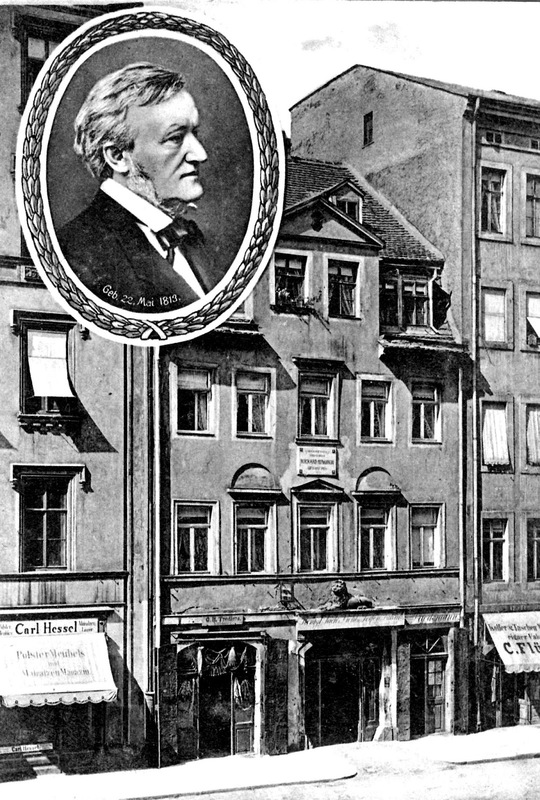 On January 13, 1933 the newly-elected National Socialist Party celebrated the fiftieth anniversary of Richard Wagner's death by staging a grandiose memorial ceremony in Leipzig, the composer's birthplace. 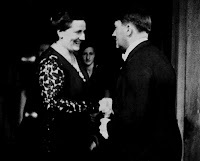 Adolf Hitler invited Siegfried Wagner's widow, the English-born Winifred, and her son Wieland to be guests of honor at this event. This tribute by Hitler was the continuation of a deep friendship that had begun in 1923 between the Führer and the Wagner family, forging a link between the new Germany and the country's most revered composer. Within weeks of becoming Chancellor of Germany, Hitler had appropriated Wagner and made him the Reich's great beacon. Each summer, from 1933 to 1939, Hitler attended the Bayreuth Festival, and he made the Wagner estate, Wahnfried, his second home. Because she had been one of his earliest supporters, Hitler had great affection for Winifred. Hitler repaid the Wagner family gratitude by pledging his undying friendship, and his deepest devotion to Richard Wagner and Bayreuth. With the assistance of Dr. Josef Goebbels, Hitler's untiring propaganda minister, Richard Wagner became the legendary and ideological voice of the new party, and the musical standard by which all classical composers would, from now on, be judged. 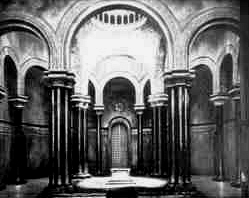 Around the time that Hitler came to power, the Bayreuth 'holy of holies' still existed: the original Paul von Joukowsky (1845-1912) sets used at the premiere of Parsifal. They were still in use at the Festspielhaus even though they were falling apart and were dangerous to the singers. Realistically, the time had come to replace the production, and the logical person to design the sets would be Emil Preetorius. The stage designer Emil Preetorius (1883-1973) was born in Mainz and was one of the most important stage designers of the first half of the 20th century. He studied law and art history in Giessen and in 1909 he co-founded a school of illustration and the book trade in Munich together with Paul Renner. 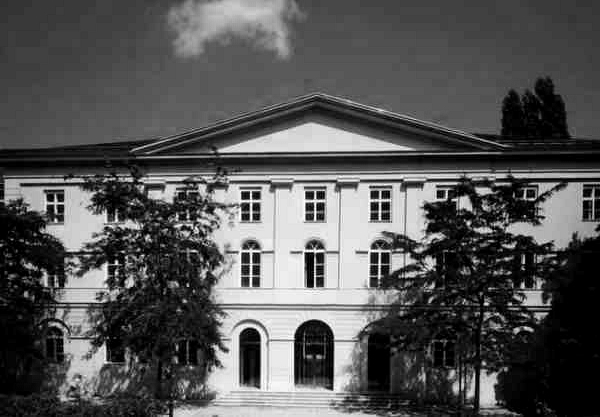 In 1928 Preetorius became a professor at the Munich “Hochschule für Bildende Künste”. 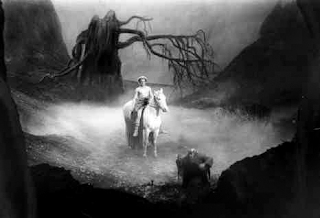 He became the head of scenery for the Bayreuth “Festspiele” in 1932. 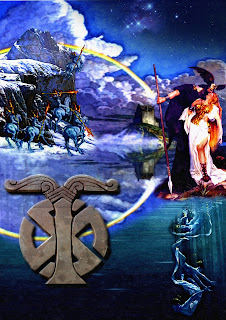 During the 1930s Emil Preetorius’s scenes, such as the rock of the Valkyrie for the “Ring des Niebelungen”, were among the most important and influential designs for Richard Wagner’s works. A petition began circulating against this decision, after all, this was the scenery "on which the eyes of the Master had reposed," and the conservative faction at Bayreuth believed that the scenery needed to be kept and revered like a holy icon. Over a thousand signatures were collected, including those of Arturo Toscanini and Richard Strauss. Winifred Wagner sent the petition to Hitler along with a pamphlet accusing Preetorius of being "un-German" and "under Jewish influence." 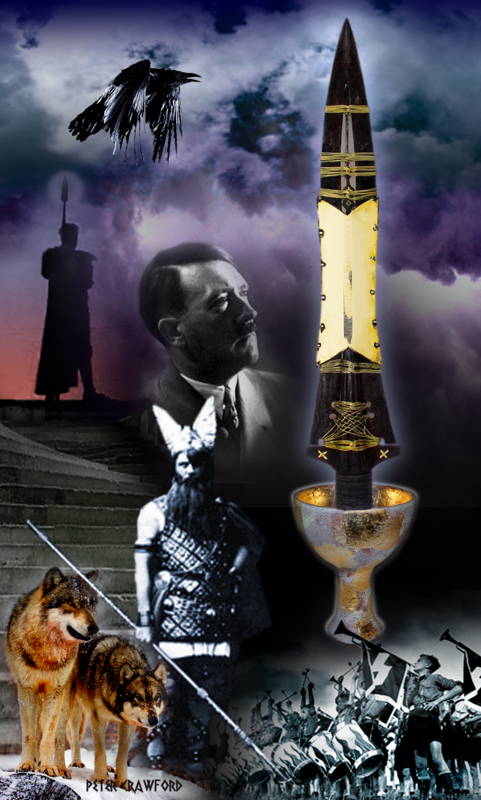 Hitler, on the other hand, favored a new Bayreuth production of Parsifal, and selected Alfred Roller to design it. 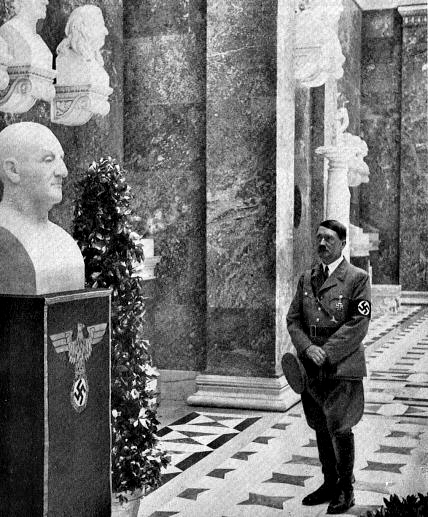 The Führer was a great admirer of Roller's work in Vienna. Following all the controversy,. 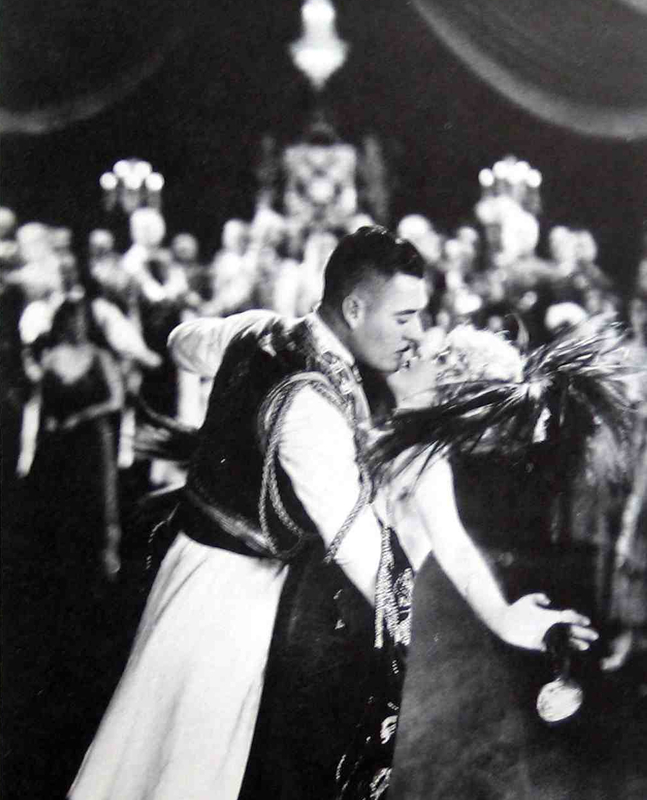 Alfred Roller's production premiered in 1934. There were, however,only a few changes to the overall designs that had originated with Paul von Joukowsky. The temple cupola in the second scene of Act One disappeared, and this made many conservatives very disappointed. Winifred once again appealed to Hitler that there should be yet another new production of 'Parsifal'. 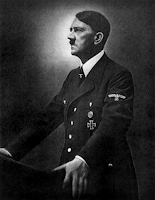 Hitler agreed, and suggested that Wieland Wagner design the new sets. Hitler had always revered Siegfried's son because he was a direct descendant of the Master. Once the war began, Hitler gave orders that Wieland should be permanently exempt from military service. 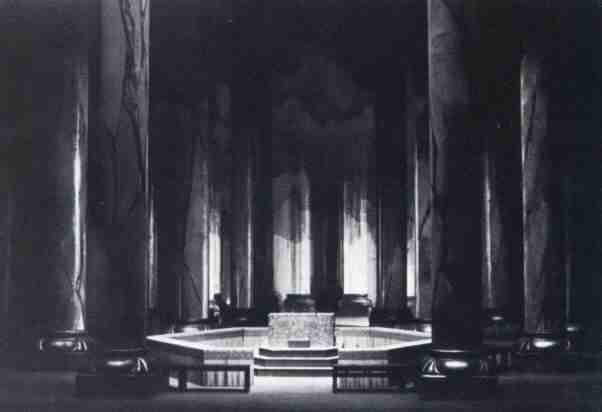 Young Wieland therefore designed the sets for the 1937 'Parsifal'. Wieland was the elder of two sons of Siegfried and Winifred Wagner, grandson of composer Richard Wagner, and great-grandson of composer Franz Liszt through Wieland's paternal grandmother. In 1941, he married the dancer and choreographer Gertrude Reissinger. They had four children Iris (b. 1942), Wolf-Siegfried (b. 1943), Nike (b. 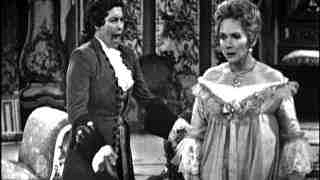 1945) and Daphne (b. 1946). Winifred Wagner's close friendship with Hitler meant that, as a teenager and young man, Wieland knew the dictator as "Uncle Wolf". His family connections allowed him to avoid the draft in the war.